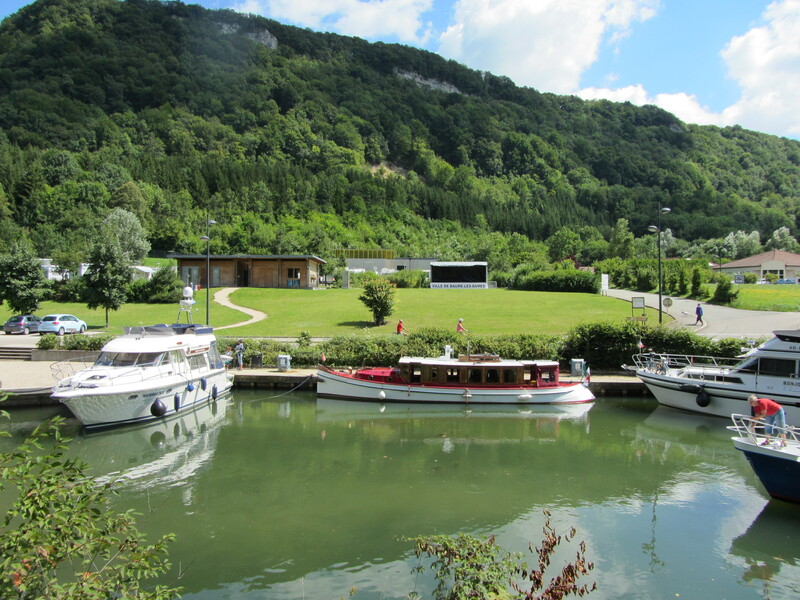 We are back in France on this lovely aire in the Department of Le Doubs river, right by the canal, with toilets and showers (for which you need a token that you can buy for €1.50 from the reception from 6pm) and all the other usual facilities: water, etc. 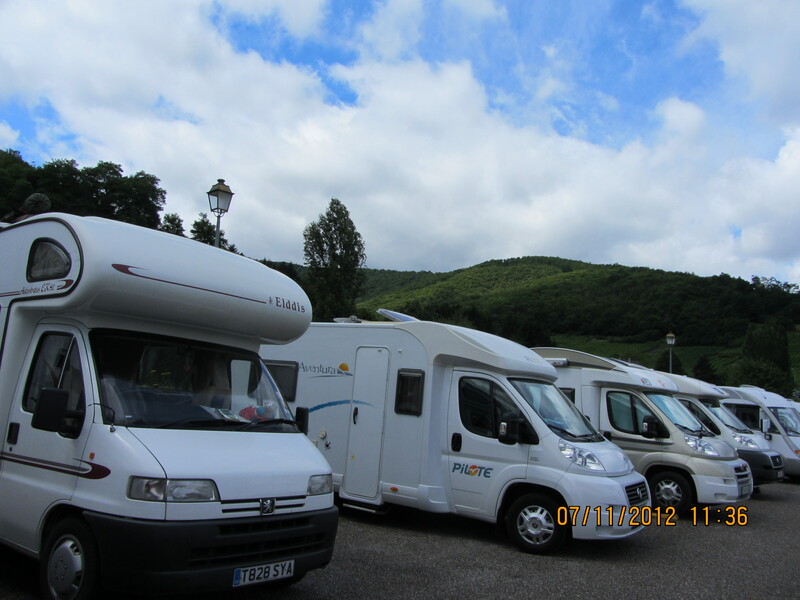 It has space for 38 motorhomes, but it’s very quiet and peaceful. This was the aire of the year in 2006 and I can see why. 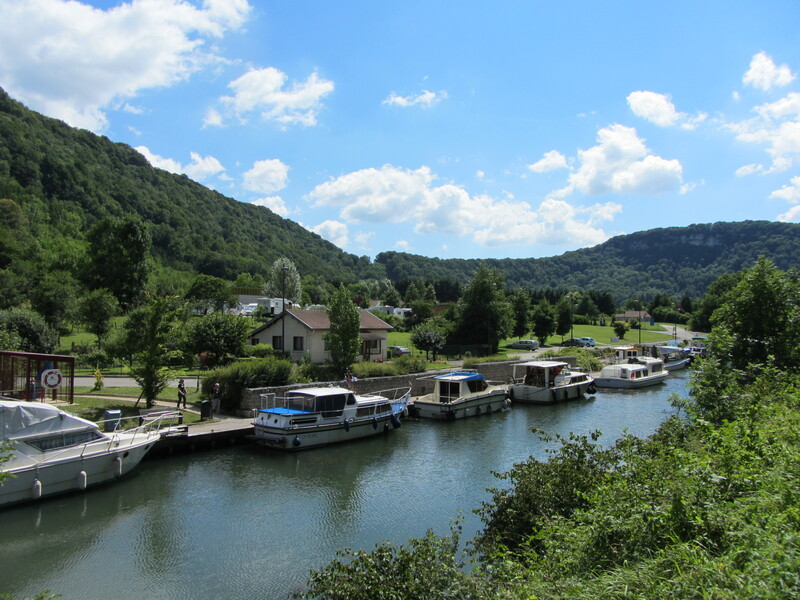 We got here just after 10.30 am after a short drive from our last night’s stop at Chavannes-sur-l’Étang in the Haut Rhine department. 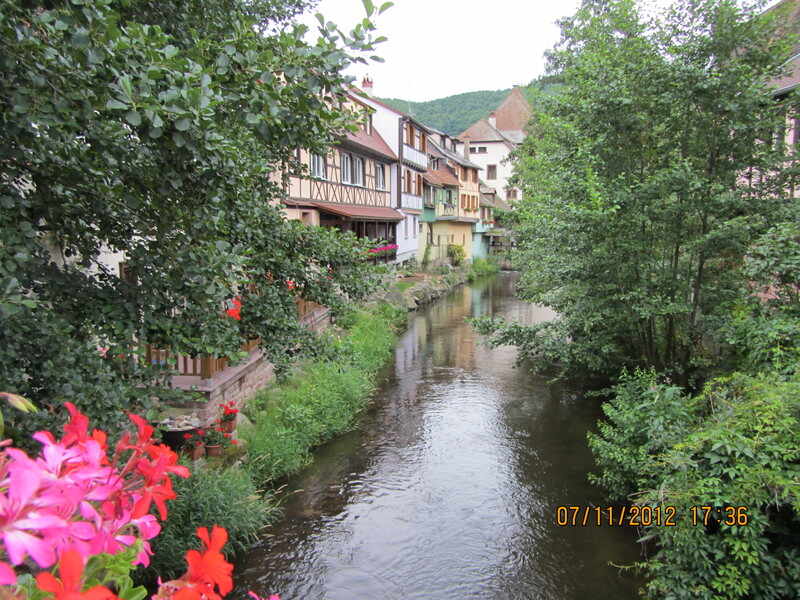 Again, that was another charming, clean and tranquil stop along the way, where tours were organised from La Porte d’Alsace leaving at 8.30 am to discover the wonders and cuisine of the region. 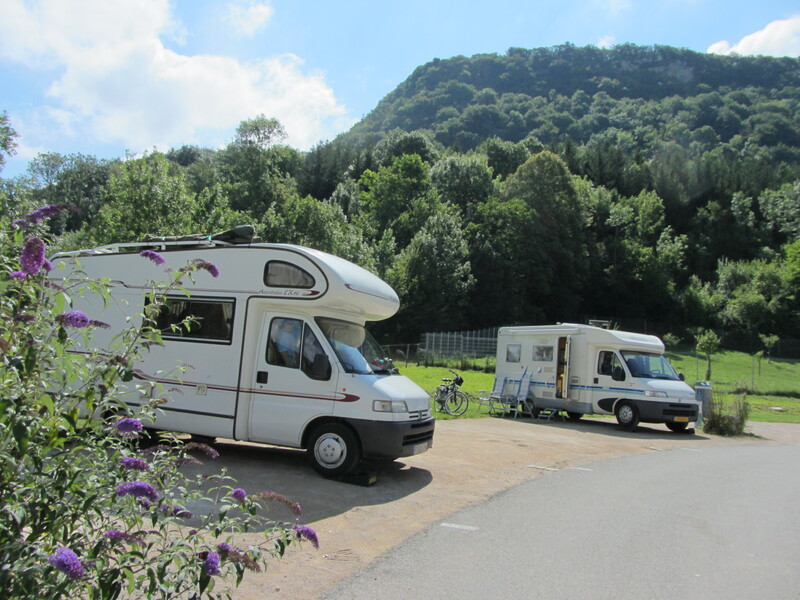 We were also asked to complete a questionnaire about the facilities on offer at the aire itself (first time ever), so these people really care about making life comfortable and pleasant to the like of us, fellow motorhomers. 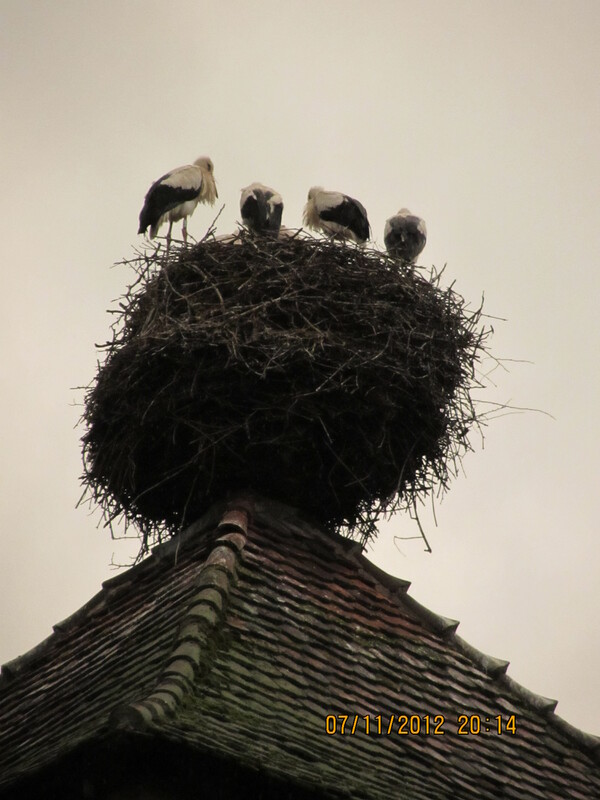 We just love the tranquillity and serenity of these rural areas and one can almost hear the fabulous Bethowen’s Pastoral symphony or Delius and Vaughan Williams’ enchanting works. 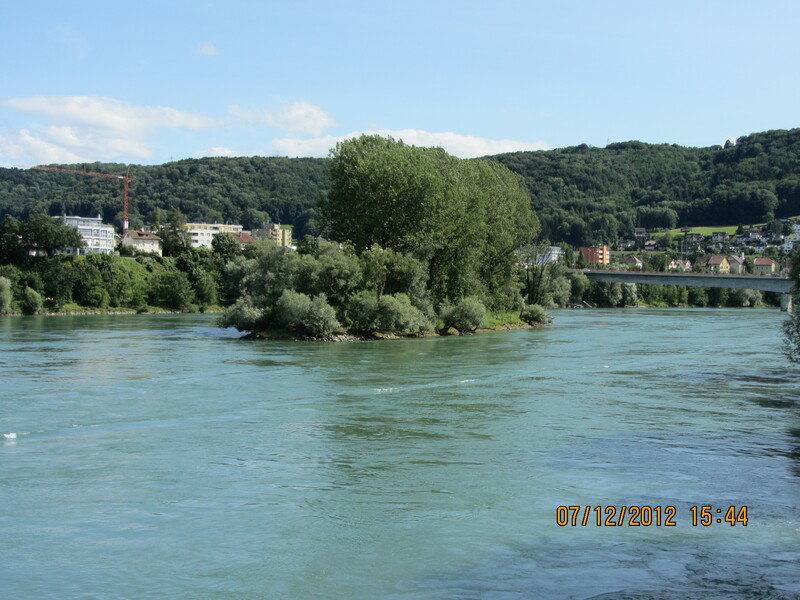 Crossing the border from our final stop in Germany, however, was a bit of a nightmare. 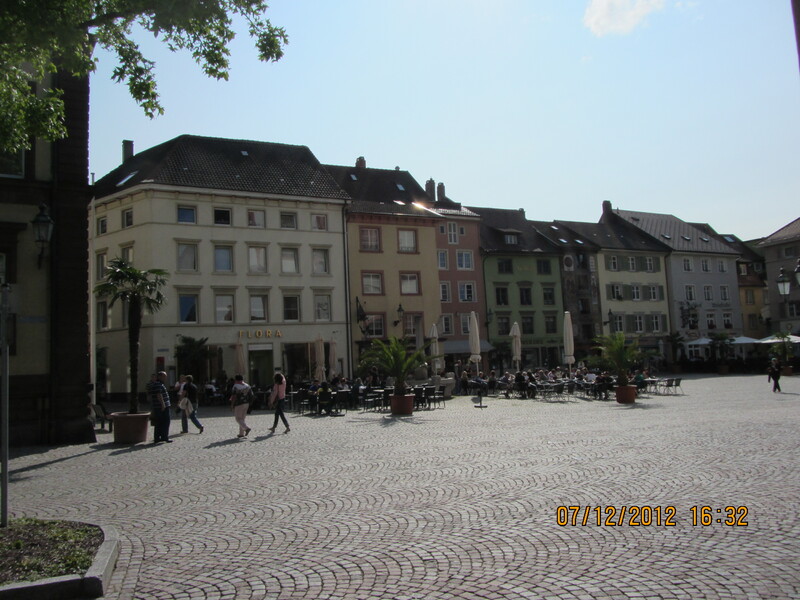 After our stop at Füssen we went to Überlingen on the Bodensee lake, where again we were lucky to find a space in the very popular Stellplatz for €10 a night. 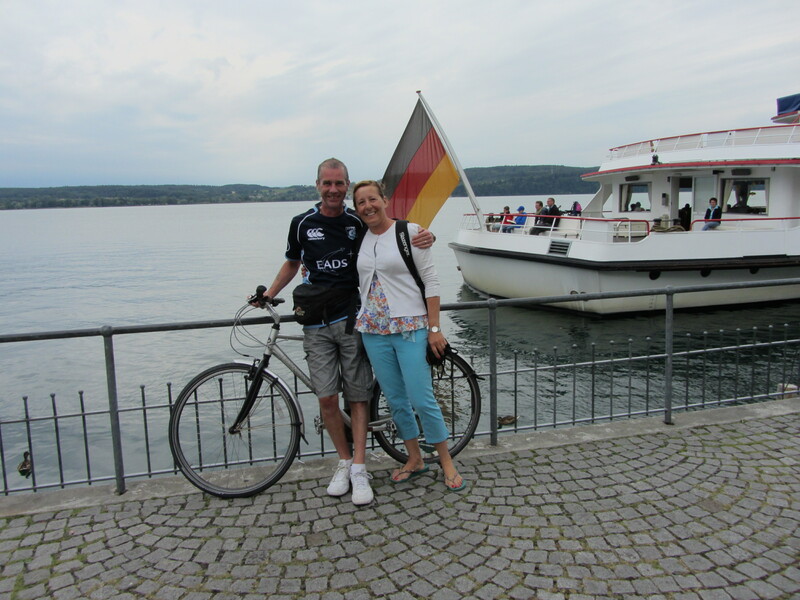 We cycled into the town and along the Bondensee and enjoyed a drink at one of the café/restaurants along the front. 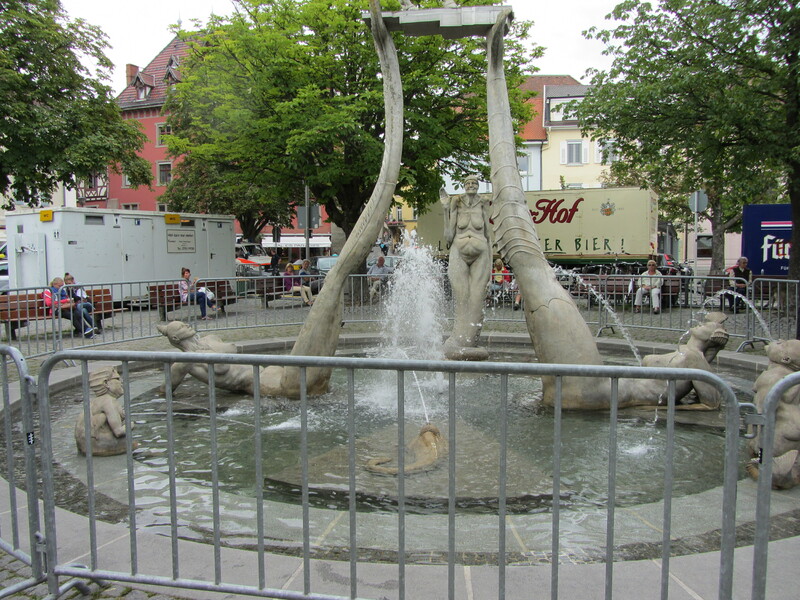 The town was very lively getting ready for their summer festivities, which reminded us of Friedrichshafen last year. The next day we followed the A31 northwest to join motorway 98 southwest past Singen and Schaffhausen, which happens to be in Switzerland and where we had to buy the obligatory motorway pass for €40 (£30), but the signposts weren’t very clear and we couldn’t see the directions and exits to where we wanted to go (Waldshut-Tiengen and Laufenburg), so when we saw the sign for Germany we took that exit, which took us back north to Blumberg. 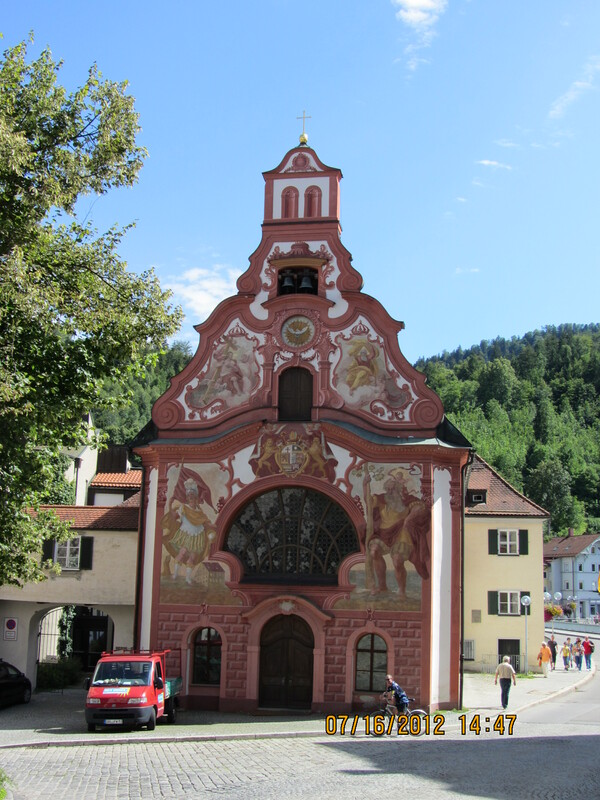 At this point we decided it would be better to use the Satnav again, which took about 5 minutes to position itself, but eventually directed us towards Titisee-Nuestadt, further north than we intended, even though it was a beautiful drive and lovely to see the Black Forest again. We continued N.W. 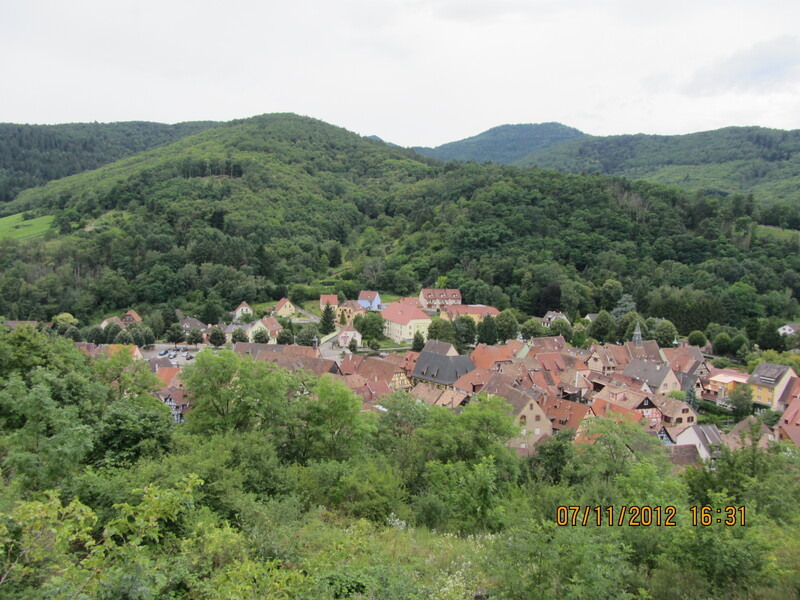 towards Freiburg and S.W on the 5 motorway to junction 65 at Neunberg and over the Rhine and border across to France. We needed to do some shopping and when we saw a big Carrefour hypermarket outside Mulhouse, we got off the road D39, but they had put up height barriers and we just couldn’t get in. We tried going round the road, but this took us back to the A35 motorway heading north yet again towards Ensisheim and got stuck on it for 10km to the next junction 31 where we had to make another U-Turn. 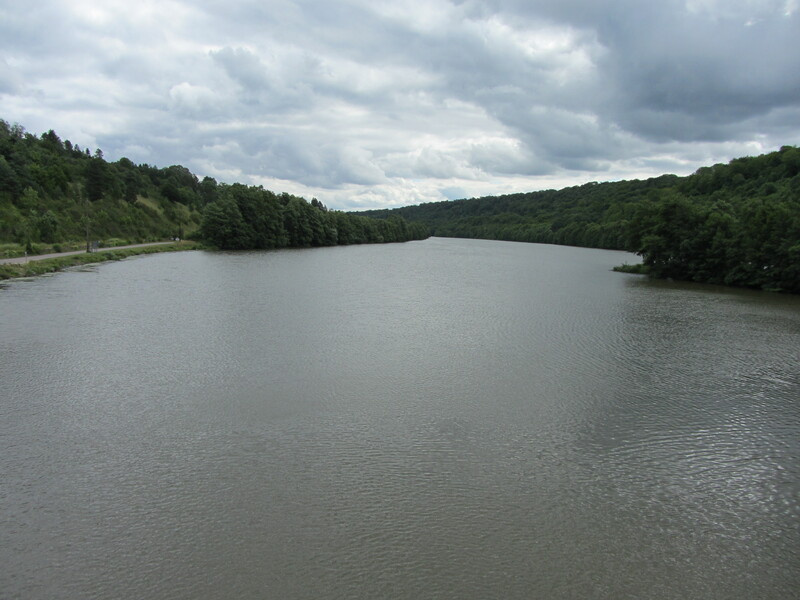 Exasperated, we gave us on unwelcoming Carrefour and went back south to Altkirch and west to Chavannes-sur-l’Étang, just 12km east of Belfort. 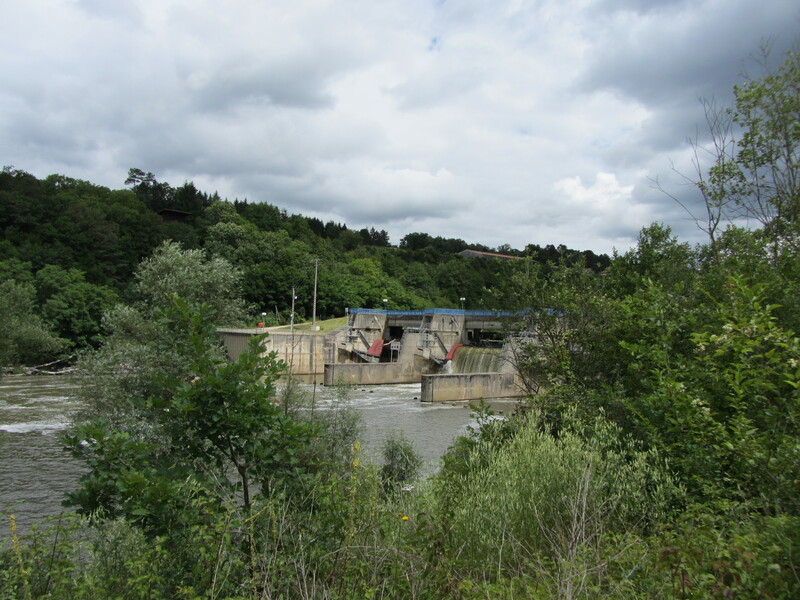 We finally found a wonderful Super U – with NO height barrier – where we got some local delicacies like tuna and tomato quiche, which was utterly delicious if a bit pricy at €10 for ½ Kg, and finally arrived at the aire just before 2pm, about 2 hours later than intended!!! 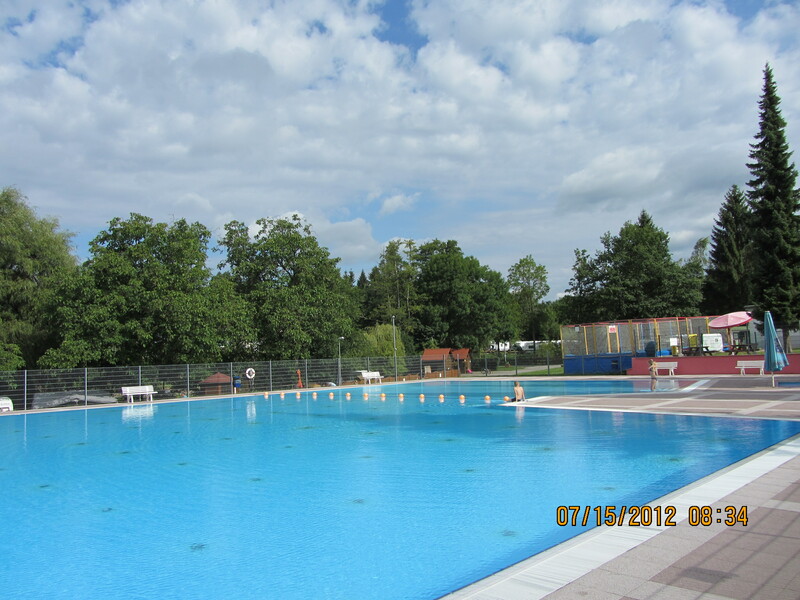 At least we are enjoying a full day in the sun here at Baume-les-Dames, where we might even stop 2 nights just to make up for yesterday’s frustratingly long drive. 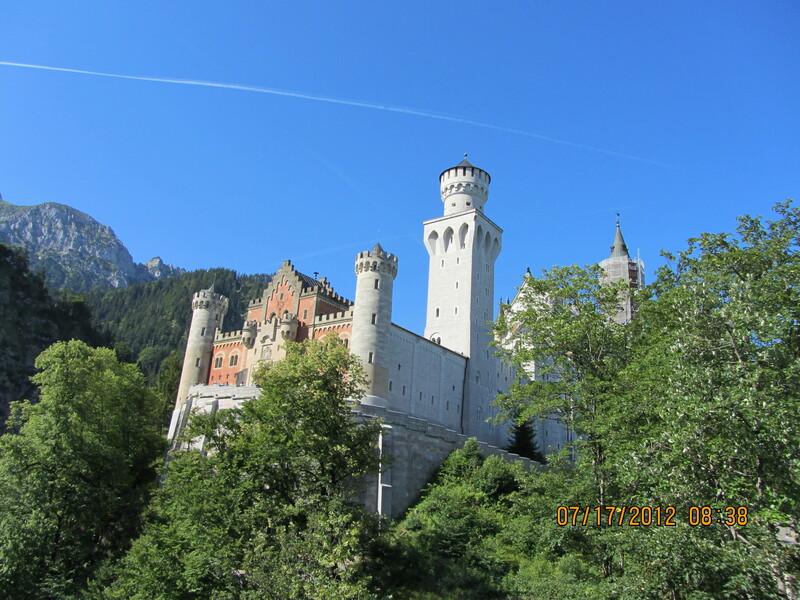 A long last a childhood dream became true today when we visited this amazingly beautiful castle in Bavaria, surrounded by the most stunning scenery of the Alps. 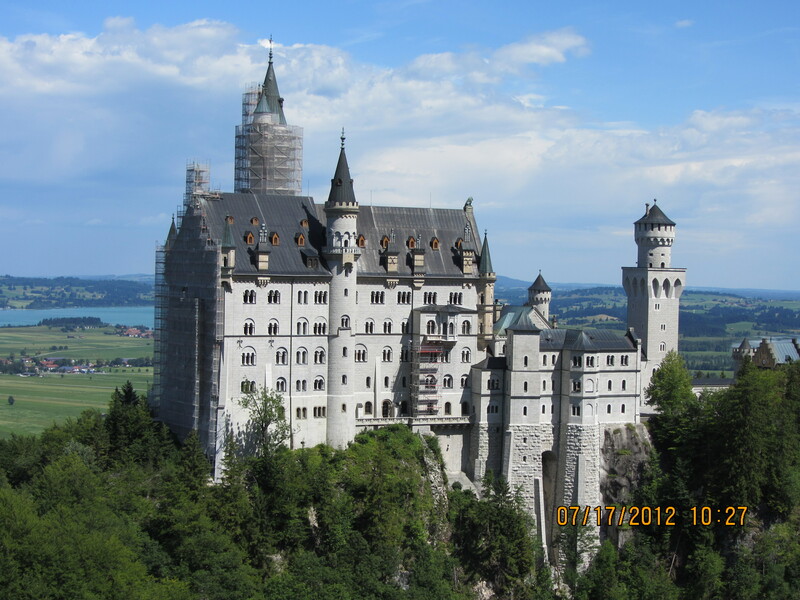 It is advisable to book the tickets the day before in order to avoid the long queues when you actually want to visit. 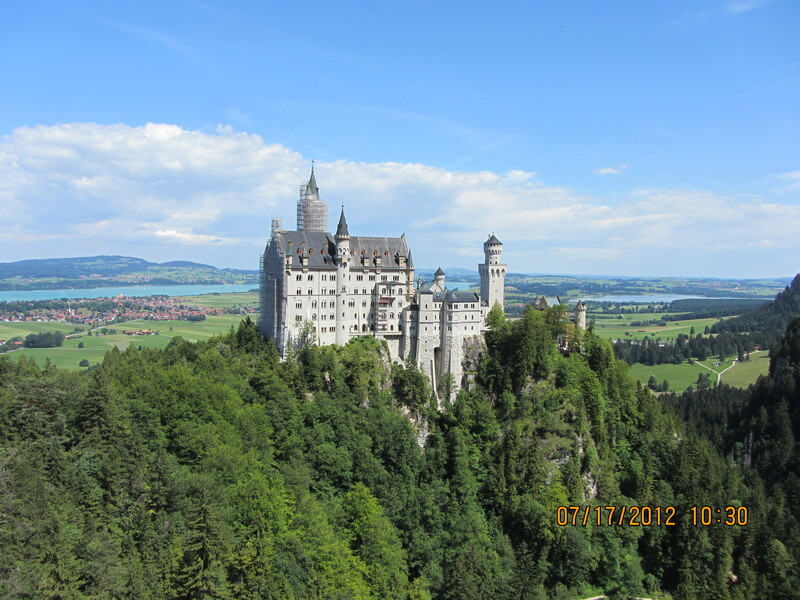 So we reserved ours yesterday at €12 per person, which included a guided tour in English. 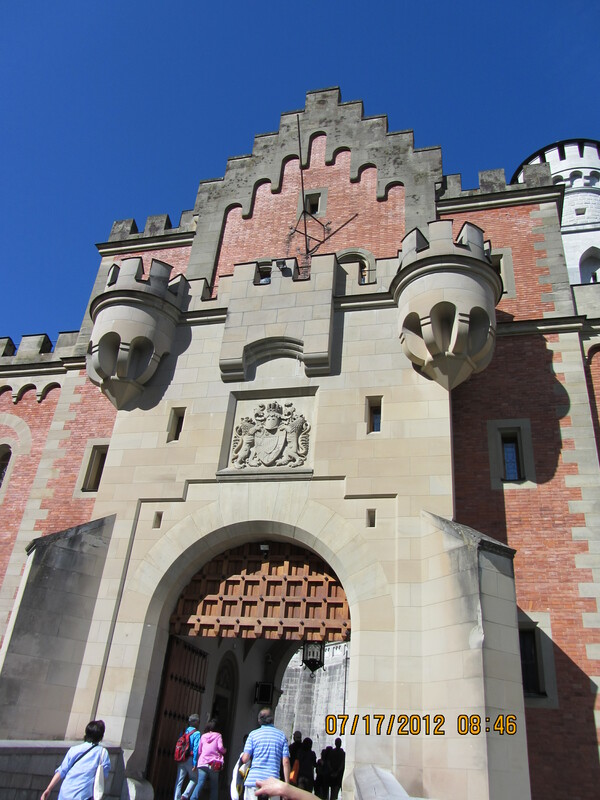 The tour was booked for 10.25 am, but we had to arrive an hour before to collect the tickets from the booking office and then walk up the steep hill to the actual castle, which took 15 minutes. 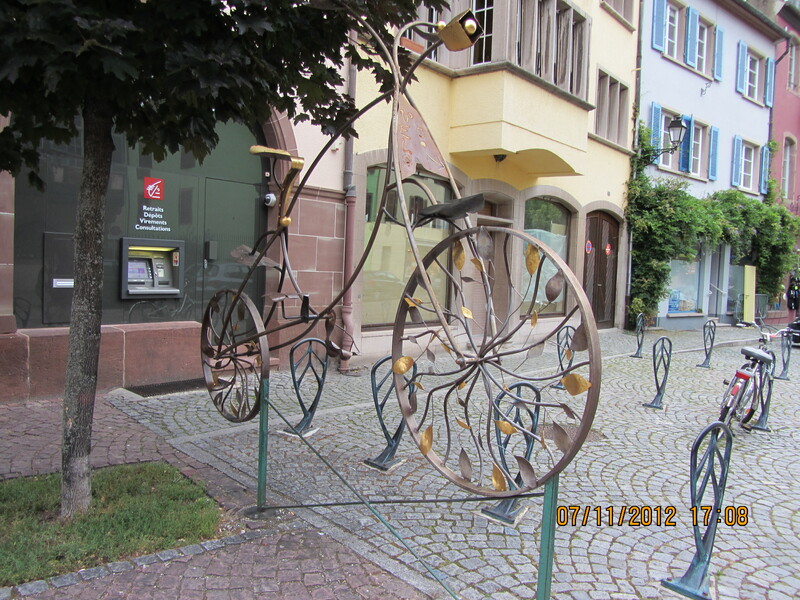 There are buses and horse-drawn carts, but we quite enjoy walking and didn’t find it that strenuous at all. 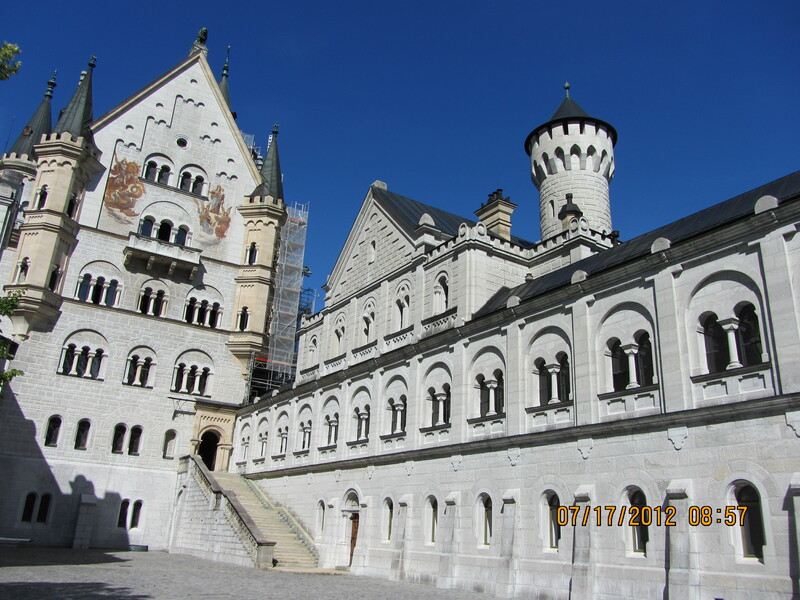 We had ample time to take lots of pictures before the tour started, but photographs are not allowed inside the actual castle, although we saw someone being sneaky when the guide wasn’t looking. 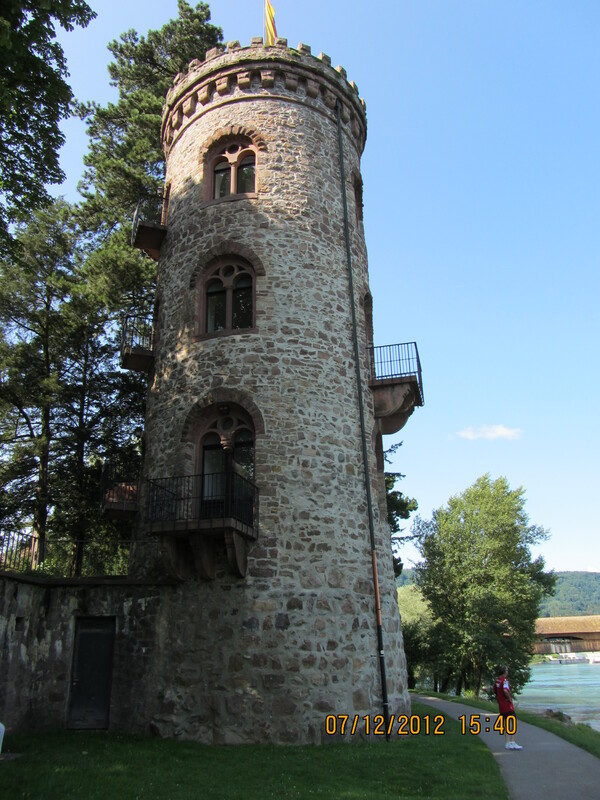 It was very interesting to find out about the history of the castle and Ludwig II’s dream in particular, even though it was never fully accomplished, due to the king’s untimely and suspicious death in 1886, 17 years after construction had begun. 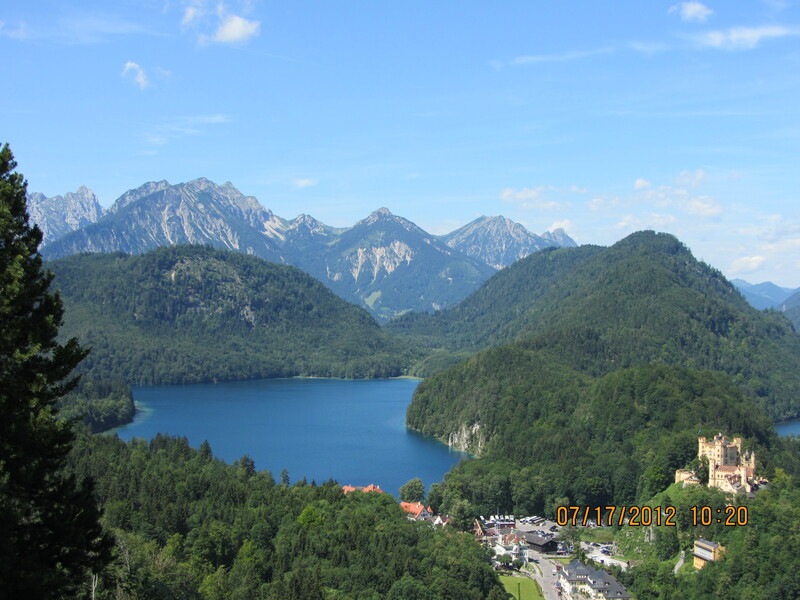 Still, it was a joy and a marvel to see what he actually accomplished and judging by all the ‘Wows’ I could hear every time we entered a new room, I wasn’t the only one mesmerised by this jewel of Bavaria. 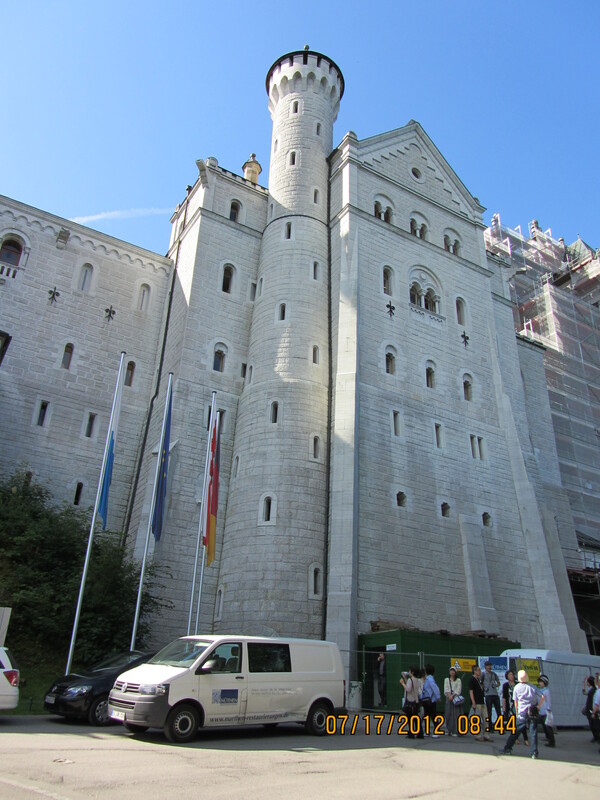 The guided tour took about 45 minutes due to the sheer number of visitors it receives, but we had some time afterwards to walk to the Marienbruecke (Queen Mary’s Bridge) for better views of the entire castle (without the current scaffolding showing too much) and the water fall. On the way back, we couldn’t help laughing at the queue of people waiting to buy their tickets, as it was already noon and very hot indeed! 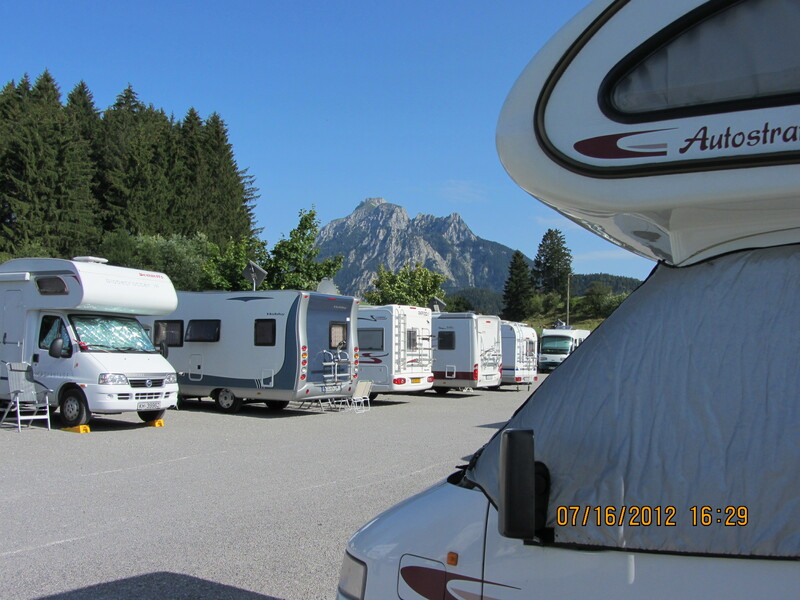 We got back to the car park and paid our €7 standard fee and, what had been deserted at 9 am was now chock-a-block with cars and motorhomes. Always a good idea to arrive early at these popular places. 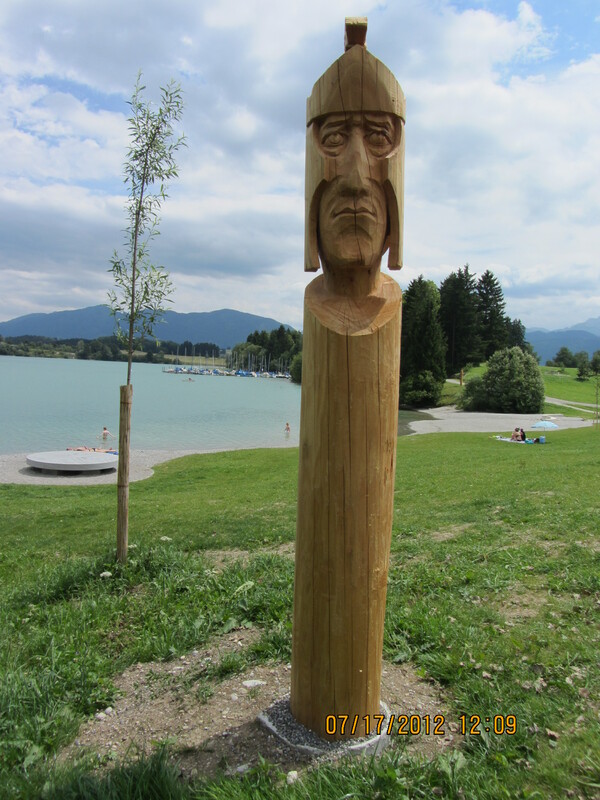 We had decided to stop at an aire in a farm for tonight and set the Satnav for Marktoberdorf/Kolhunden, but as we were driving, we spotted some motorhomes parked by the Forggensee lake, so we came to try our luck and, although there were signs indicating overnight stay wasn’t allowed, we found this other aire by the camping Seewang in Dietringen, where we are now set for the night for only €10 plus €2 for electricity. 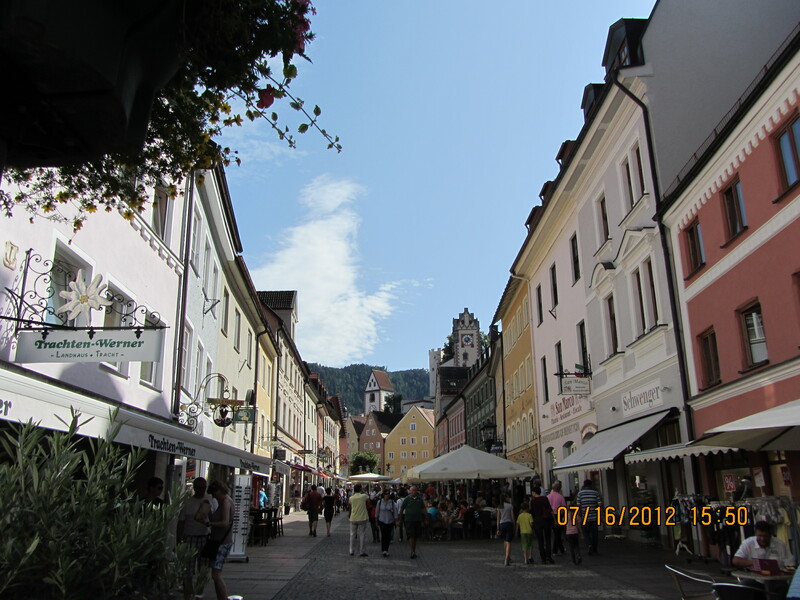 Yesterday we stopped at the charming town of Füssen, part of the Romantische Straße, again very well maintained with toilets, showers, dogwash, recycling facilities, a restaurant, a bakery and all kinds of supermarkets just outside the entrance. 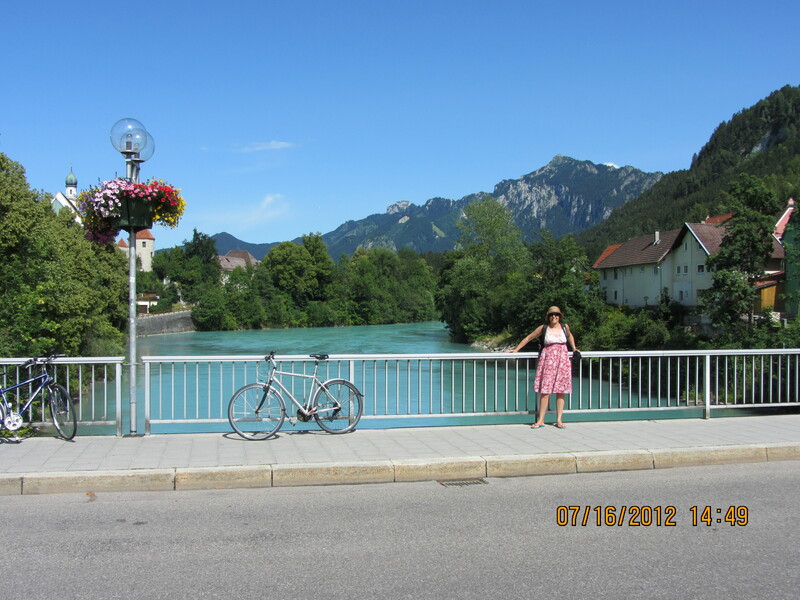 We waited till 6 pm to pay for our €12.50 fee and enjoyed a cycle ride into the town itself and the local beer. 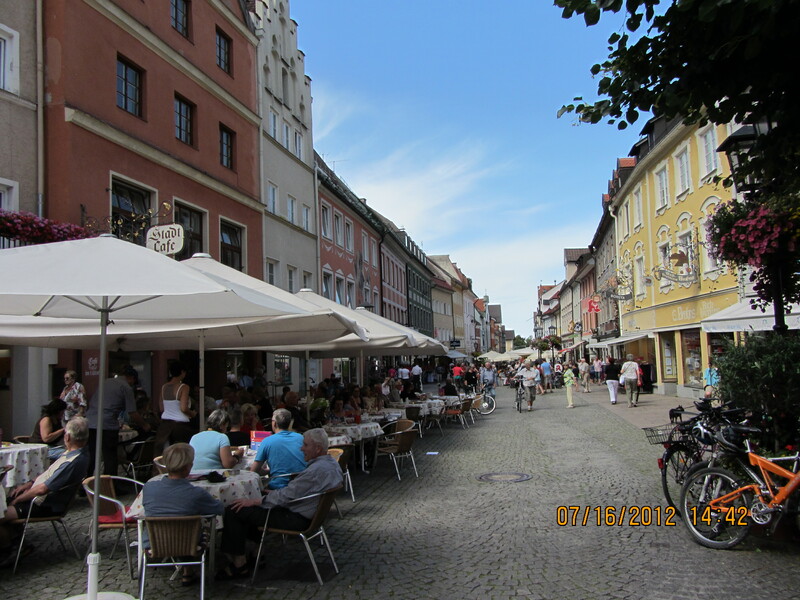 It’s by far the busiest high street I’ve seen in the way of people sitting outside cafes enjoying the hot weather and their food and drinks. 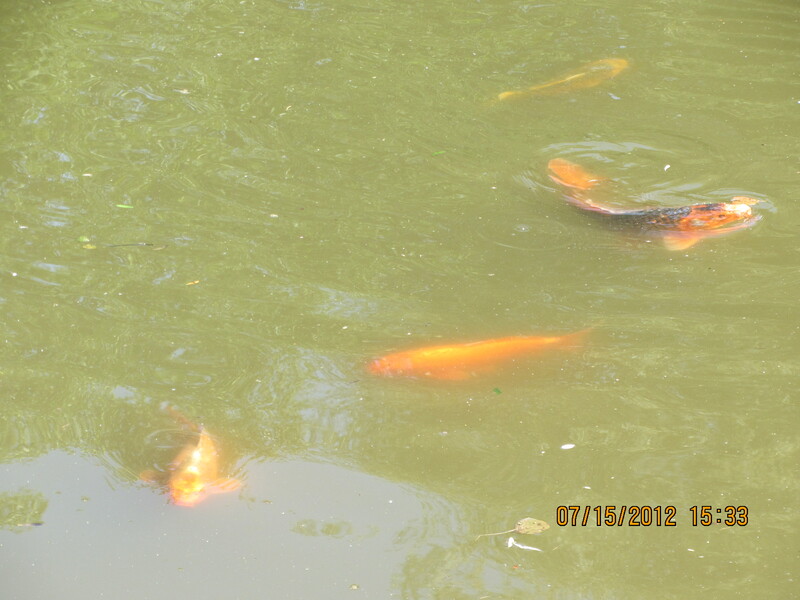 It had a wonderful happy atmosphere that was really inviting to stay. 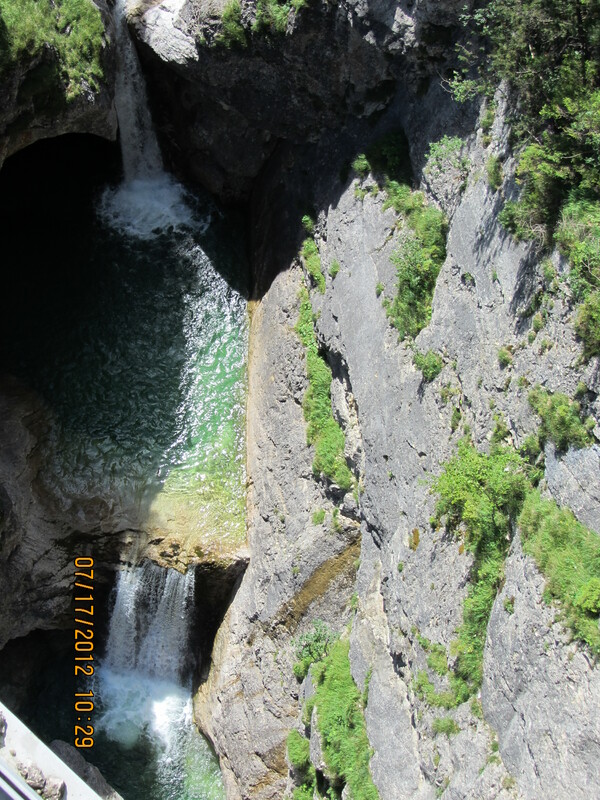 Yet another place to recommend to adventurous motorhomers: truly fantastic! This is our second and last day at this huge, very well equipped and organised campsite, excellent for young families, as they have all kinds of entertainment going on, including pony rides through the boundary woods, dancing by the swimming pool, making your own pirate hats, swords and face painting and fishing in the lake. 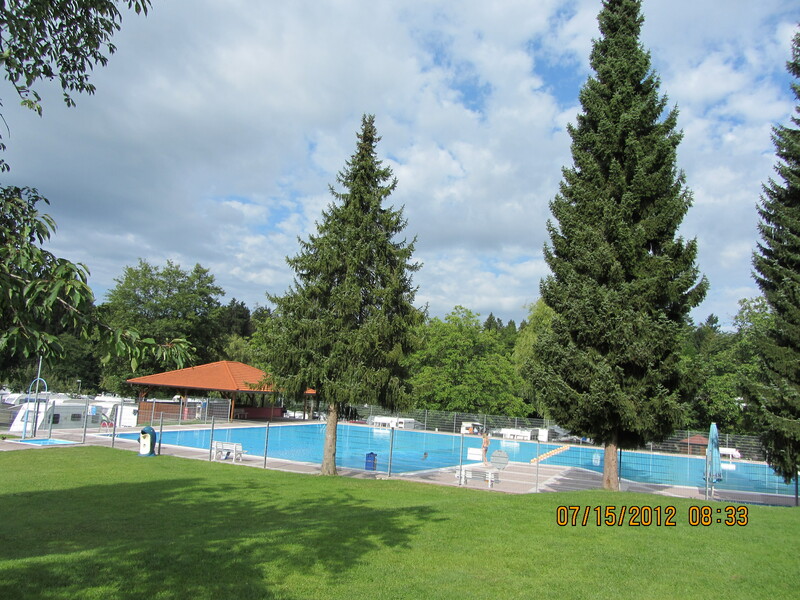 There is also a small supermarket, a restaurant and beautiful child-friendly washing facilities that look like a theme park! The place is immaculate, with lots of shower and washing facilities blocks, including a ‘dog wash’, the first of its kind I’ve ever seen! I’ve taken this opportunity to do my laundry and I had a bit of a battle with the washing machine this morning, which operates on a timer rather than whether the washing cycle has finished or not. So I put €2 in 50C. coins, as instructions indicated that for a 30°c wash, it’d take between €2 and €2.50. The instructions also indicated to go back after given time as door would open electronically after timer was up and would shut again only to be opened with another 50C. So I went back for my washing after 80 minutes, but cycle hadn’t finished and I had to put another 50C that would last 20 minutes. I returned 20 minutes later, but door wouldn’t open, so I had to put another 50C and I finally got my washing out, 2 hours after I started! Next time I’ll do my washing by hand: cheaper and quicker and a lot less hassle and time wasted waiting around. Still, it’s been a very hot and sunny day and I managed to get all my washing dry in the sun (including bedding) by lunchtime! We also got internet access after waiting 8 hours due to the sheer amount of people using it. So we finally got it at 7.45pm for 24 hours use, but it was very slow and frustrating, as it kept disconnecting itself. I tried again this morning in the sitting area outside reception with a little more success, which allowed me to post some pictures on Facebook, but when I tried Twitter it disconnected itself again and I couldn’t get it to re-connect, so I gave up on that and trying to post my blog. Again, not very impressed with this service. Considering we paid €68.80 for 2 nights, plus €3 extra charge for paying by credit card, this is by far the most expensive campsite we’ve ever been to and we don’t think it was really good value for money for us without children and we would think again before using one of these huge sites again, which are geared toward family entertainment. At least we’ve had 2 very relaxing days here, sitting in the sun and not doing very much at all other than reading, crocheting and swimming in the pool. 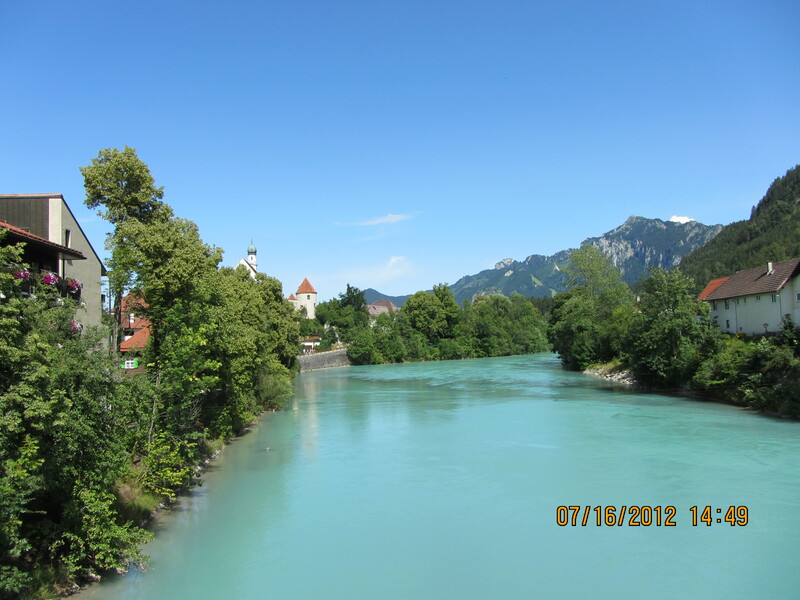 We are setting off again tomorrow towards Bavaria. I am really excited about this, so hopefully nothing will go wrong. 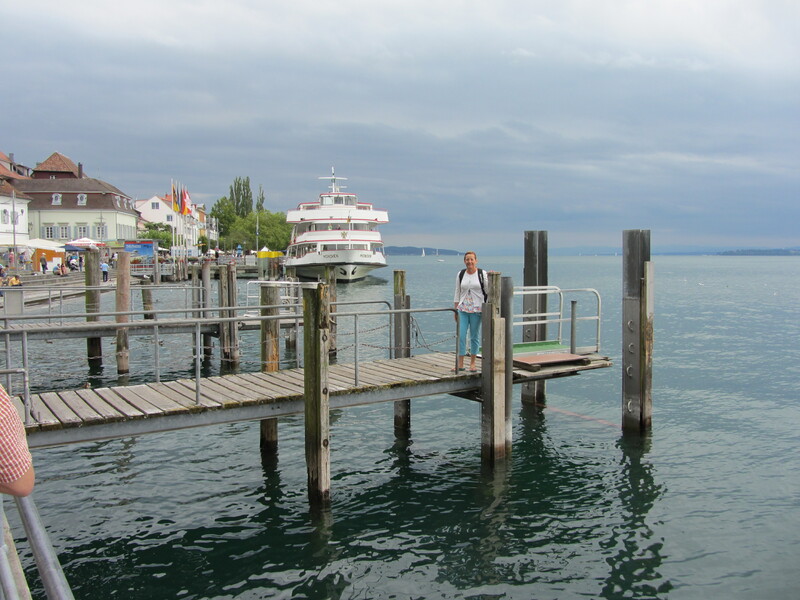 We are at a very crowded Stellplatz/car park close to the Gnadensee, about 20 km northwest of Konstanz. 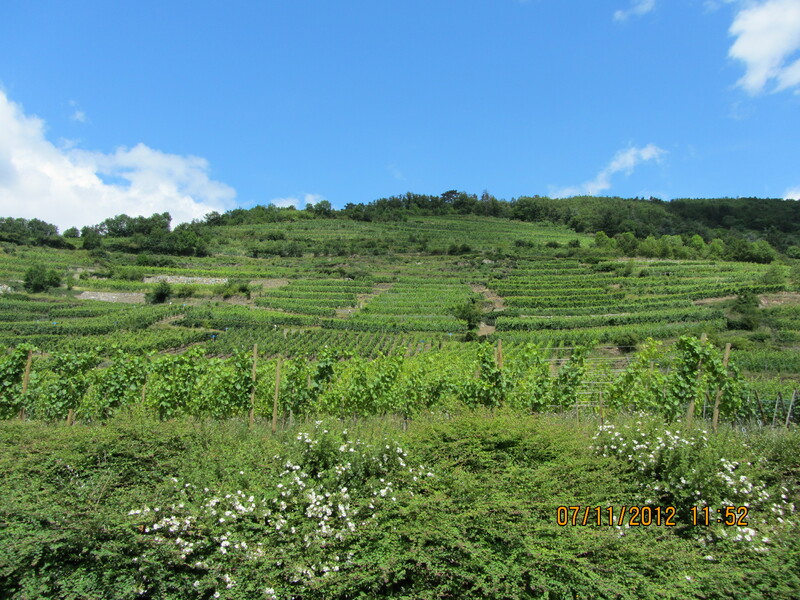 We had a very interesting drive from Bad Sackingen this morning, following the Sat. Nav. directions to Lindau to begin with, through Switzerland, skirting Zurich and Winterthur, but by 11.30 we decided we needed a break and got off the motorway just east of Frauenfeld and headed north to Konstanz and west to find the aire at Reichenau, but it was full and the lake at this point was very windy, so we made the decision to back up to Konstanz again and try this one instead. 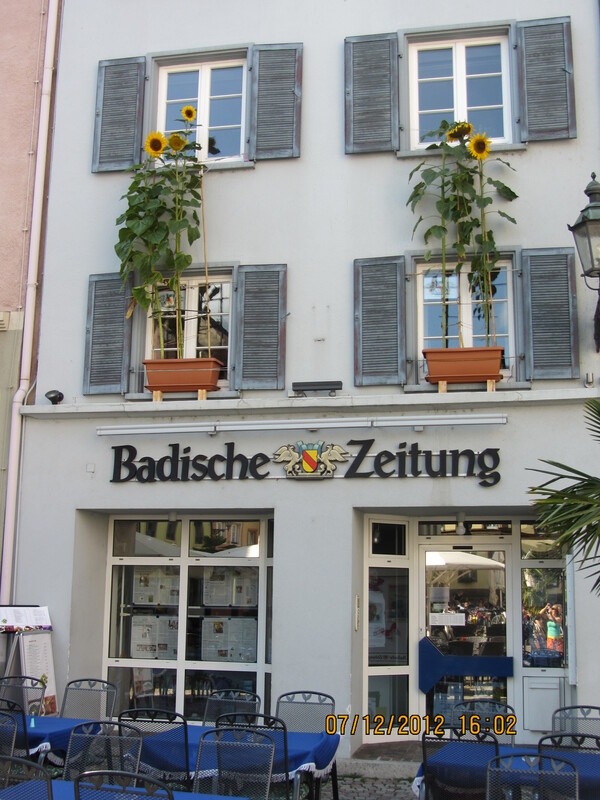 In fact, the weather has been kinder to us in Germany than in France, as we had a very hot day in Bad Säckingen yesterday after crossing the border from Alsace. 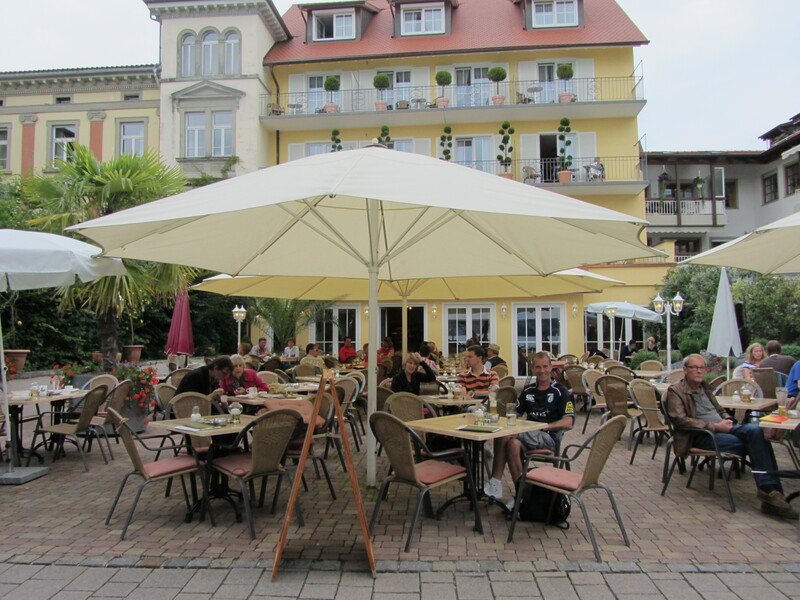 We were very lucky too with the generous space at the Stellplatz there, where we were able to put our table and chairs out for lunch and soak up the sun for the rest of the day. 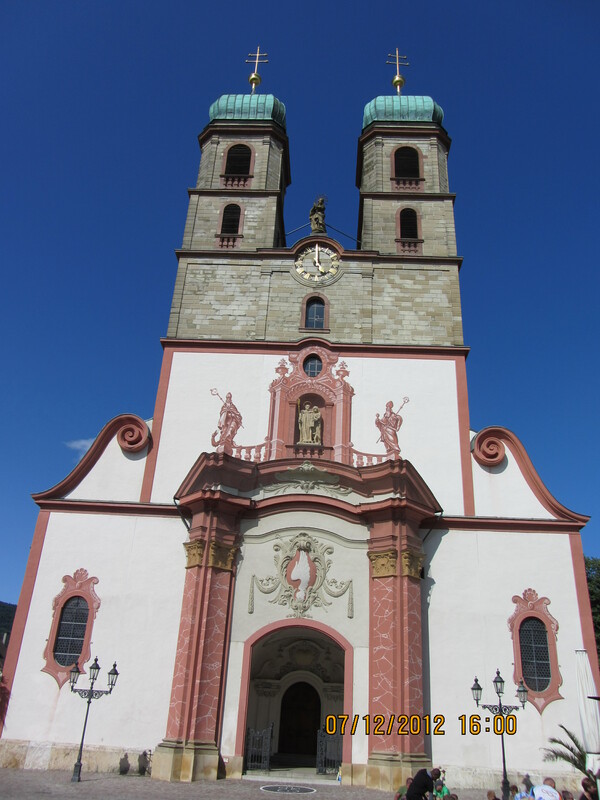 The town of Bad Säckingen itself was very pretty too, if not as stunning as Kaysersberg, but we really enjoyed a glass of the local beer in the main square by the townhall (Rathaus), just in front of the amazing church. 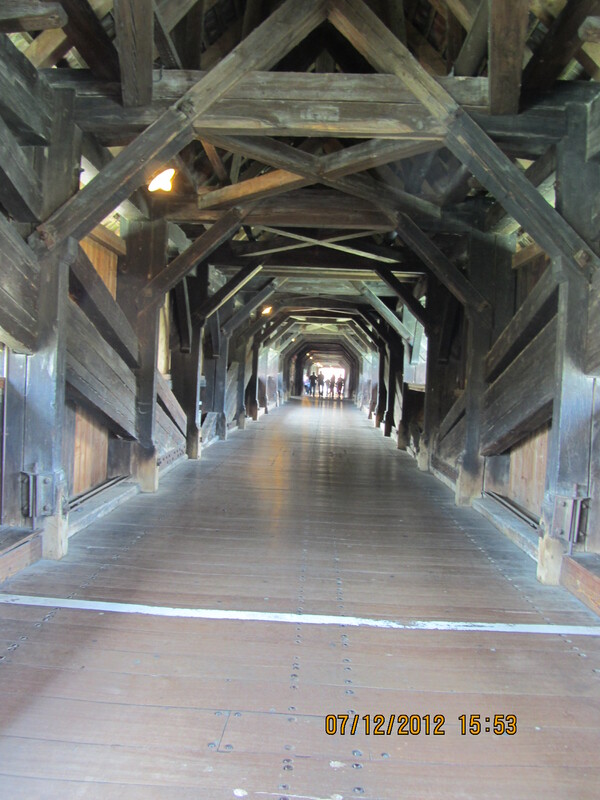 The big surprise was the wooden bridge over the Rhine to Switzerland, the magnificent Holzbrücke, and a very popular touristic attraction not to be missed. 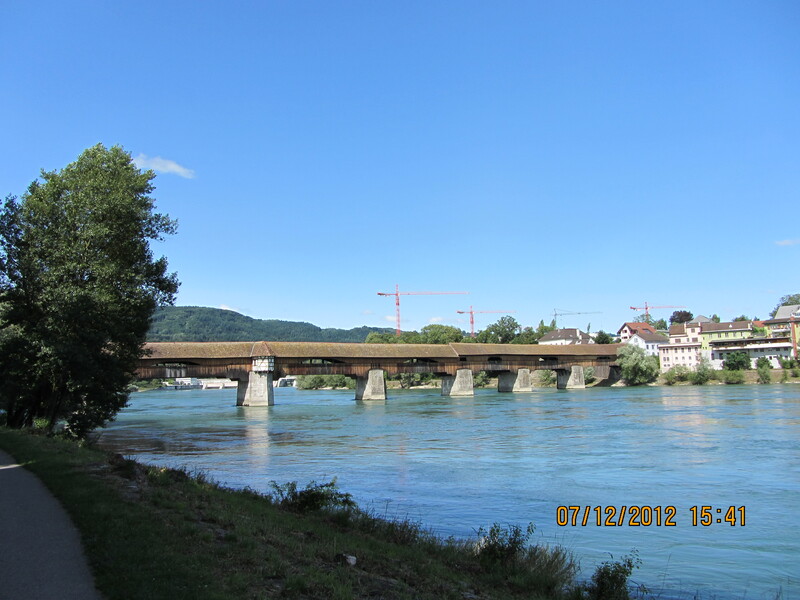 So we crossed the river and took some pictures of the beautiful views and of us in Switzerland, including a Lindt chocolate shop: a temptation I managed to resist! We finished the evening with a paella we’d bought at Leclerc, sat in the very warm evening sun at the Stellplatz and then enjoyed another episode of the ‘West Wing’ season 3. 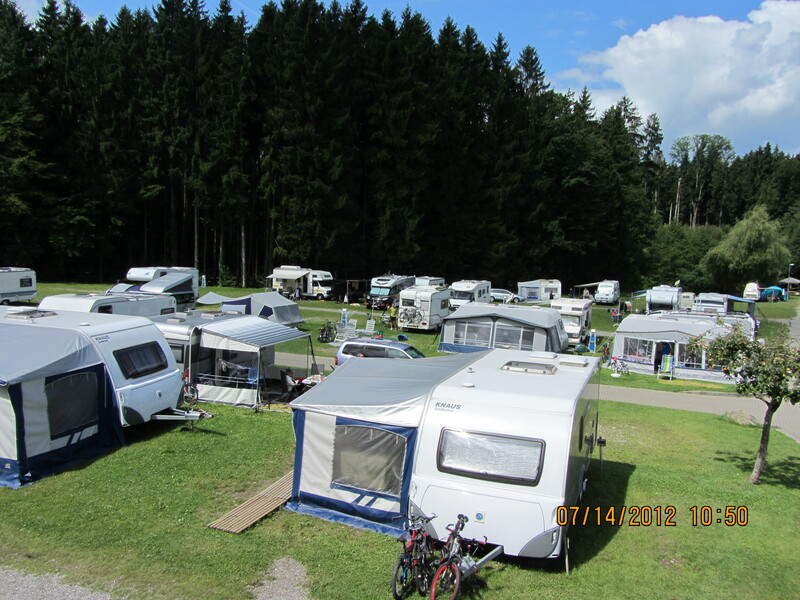 Another Stellplatz to come back to and recommend to fellow motorhome owners, just for the price of €10, which includes electricity! 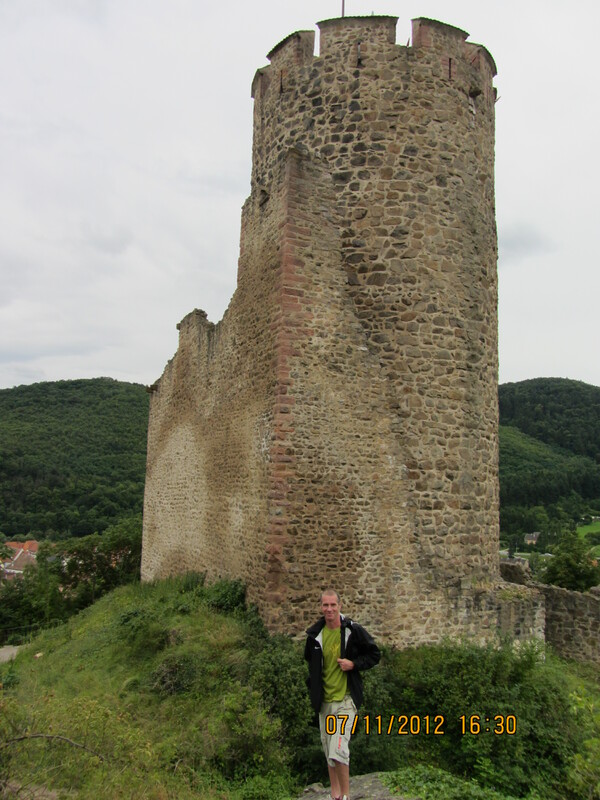 We finally found some sun and warm weather at this extremely beautiful and charming town of Kaysersberg. 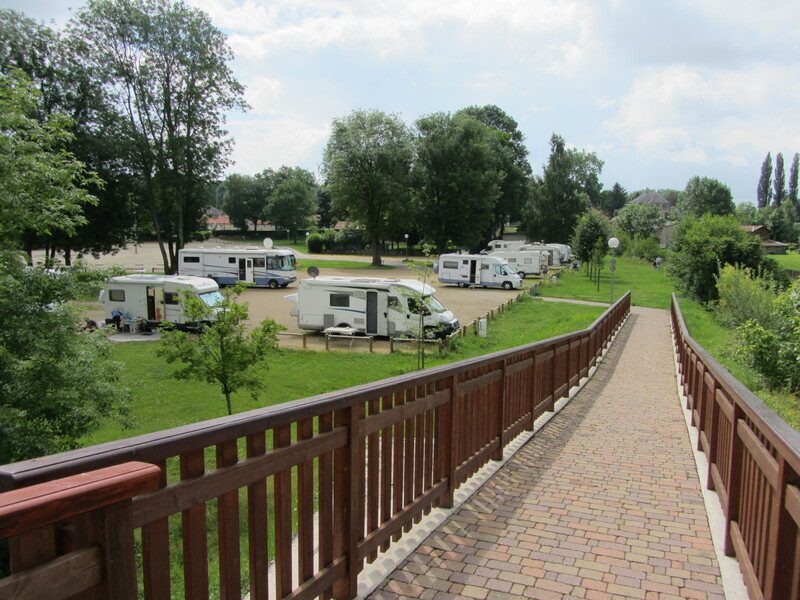 The aire is very large, with room for 70 motorhomes, clean toilets emptying facilities, clean water and rubbish and recycling bins. 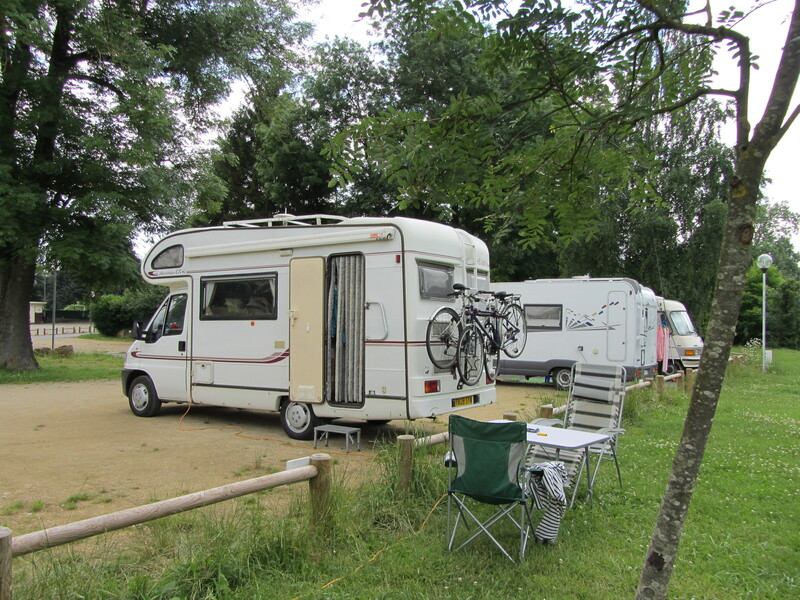 We spent 3 very relaxing days at Villey-le-Sec campsite, but the weather was changeable due to the strong wind, so we had some very hot sun, but also heavy rain. Our Lillypad windblockers really proved their worth here and I’m very pleased to have invested on this very efficient piece of equipment. 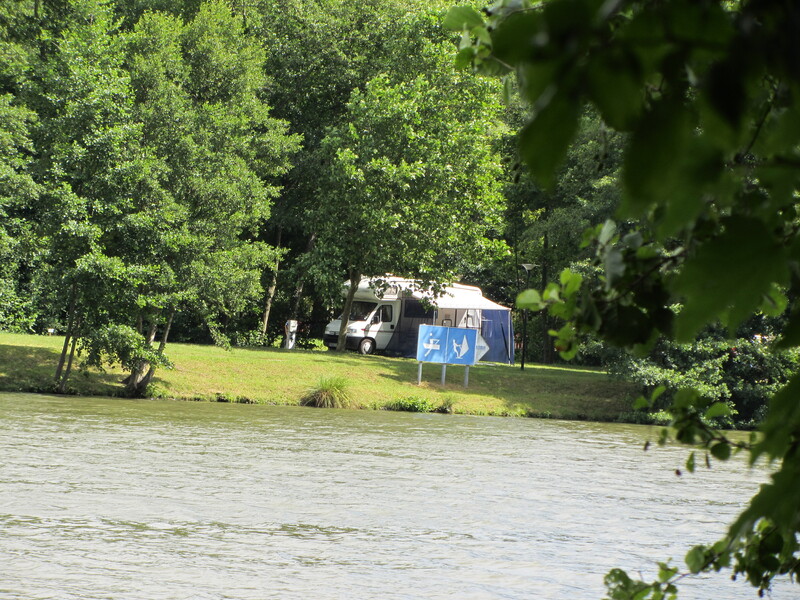 I really enjoyed my cycle ride along the opposite side of the Moselle river and stopped several times to take pictures of scenery and campsite, with Adonis fishing and our Elddis motorhome parked so close to the shore. 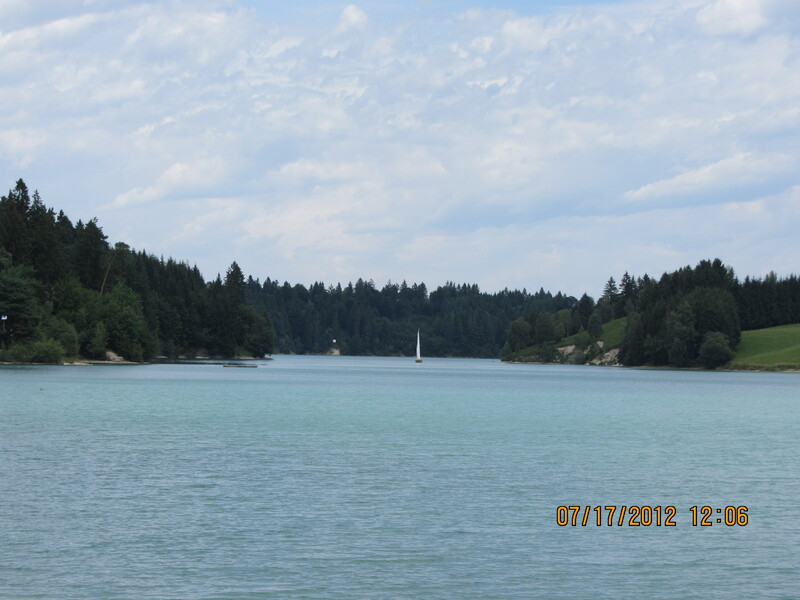 It was a very hot morning and I took well over an hour to soak up the peace and the sheer beauty of the place. 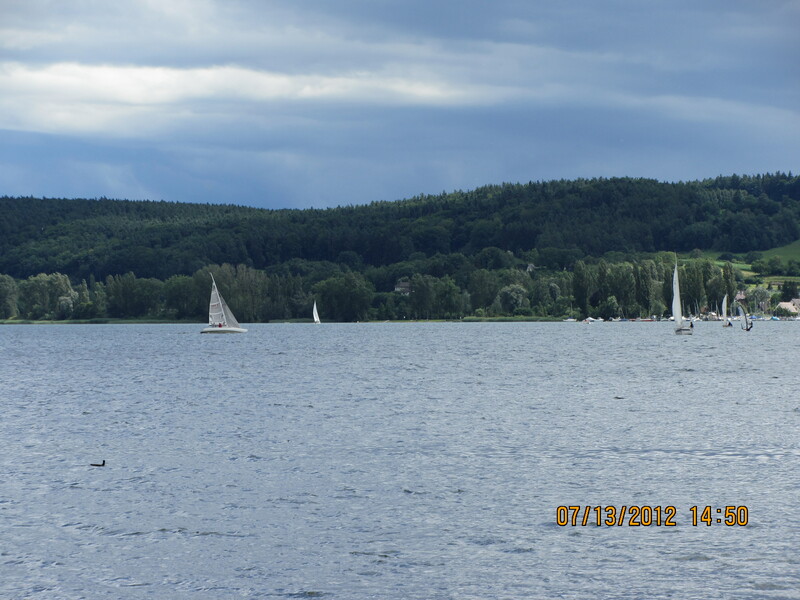 But, unfortunately, the weather took a turn for the worse and the afternoon was windy and showery. 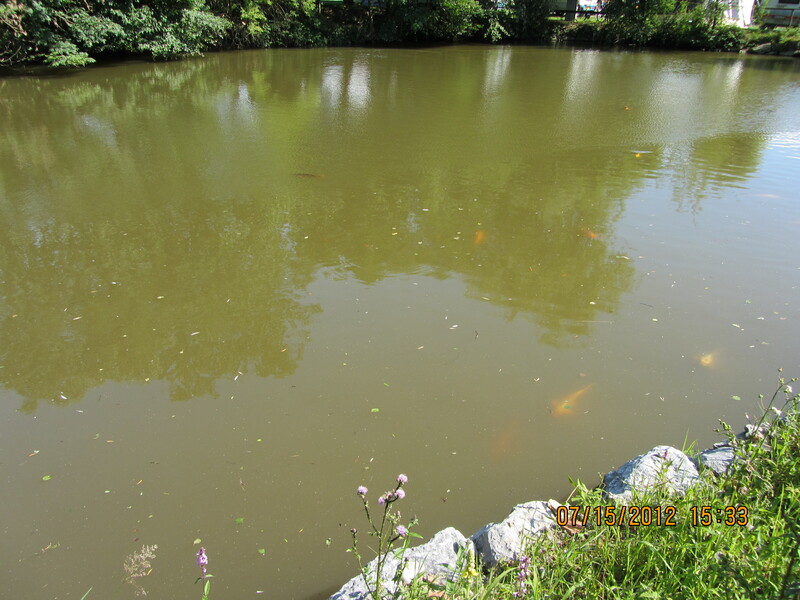 We spent one more cloudy day on the site, with more fishing and crocheting and decided to move on the next day. 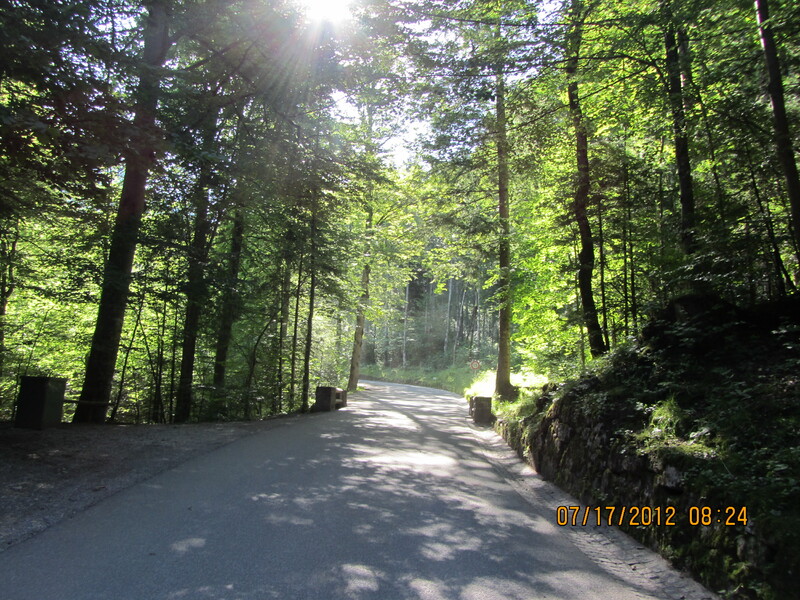 The drive to Kaysersber was pretty easy via Toul to avoid the steep climb back to the A31, as it was recommended on the campsite washing facilities block. 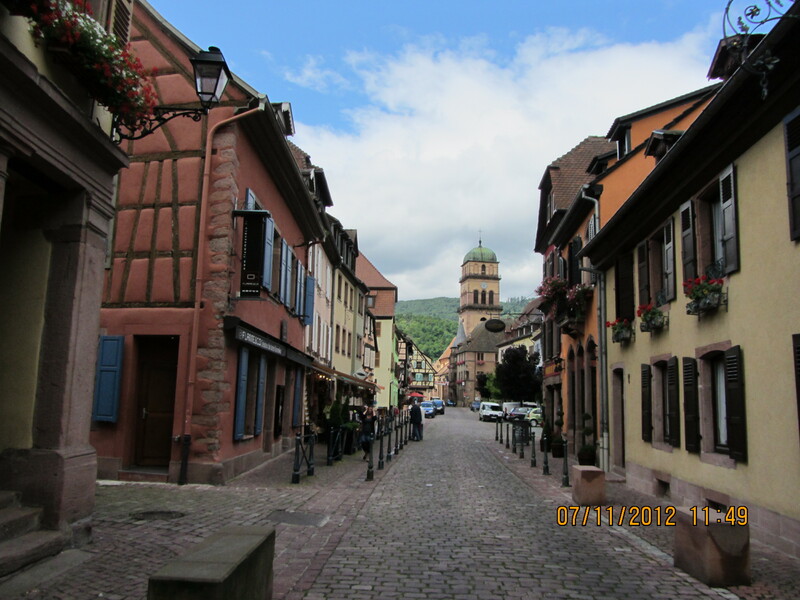 We joined the motorway at J14 towards Nancy and the A33 at J18 southeast to Luneville and the N59 to St Die-des-Vosges and finally the slightly windy and very interesting D415 towards Colmar, with some staggering views and steep climbs to Le Bonhomme at 949 metres high! Well worth the time. 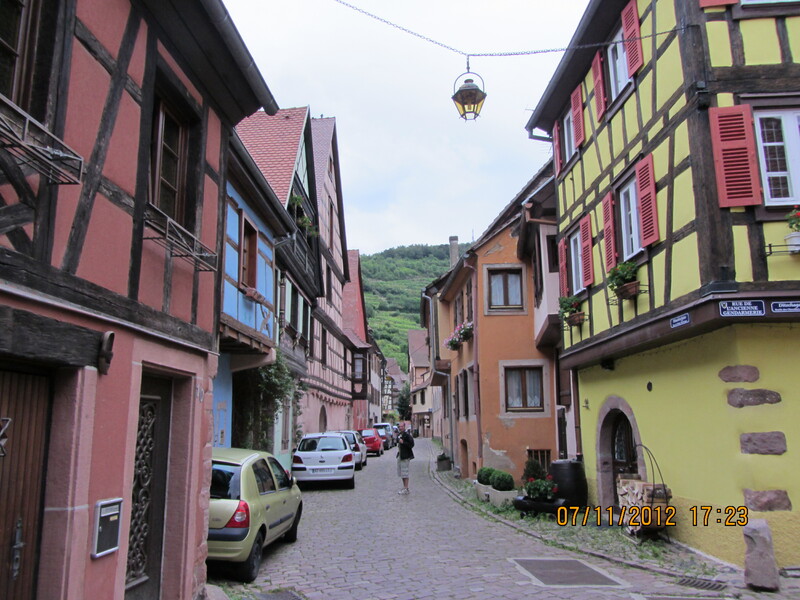 We arrived at Kaysersberg for 12.30 pm, paid our €7 fee for the motorhome aire and went for a stroll in the town, which reminded me strongly of the German towns of Bacharach and Wangen: it really felt more German than French! 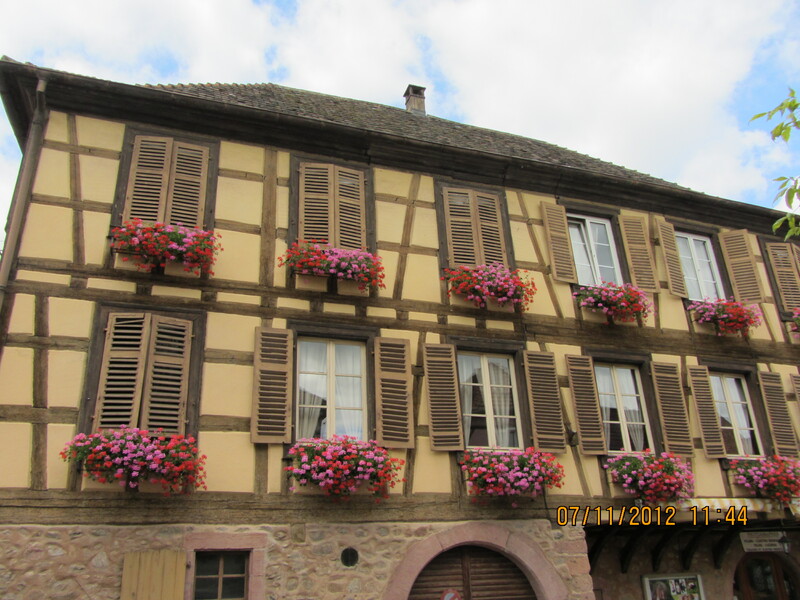 We took lots of pictures of this fairy-tale place with chocolate-box pretty houses and decided this was a fitting place to celebrate our wedding anniversary (if a week late!) in the evening. 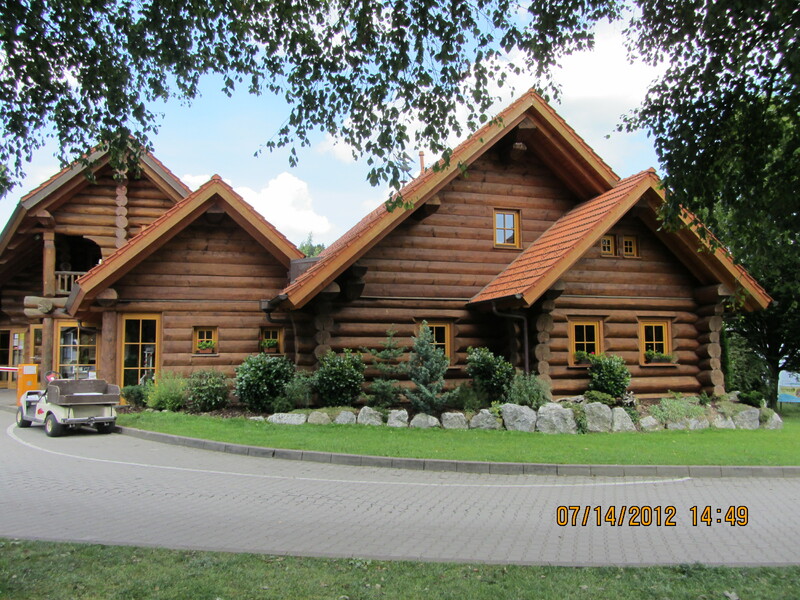 Forge Restaurant, with superb service and very cosy and romantic atmosphere. I had the Tarte d’oignons douce for starters, the 7-hour beef and the lemon sorbet with Gewurztraminer sauce and Adon had a beetroot salad, duck steak and Crème Brulee: a wonderful meal to celebrate our wedding anniversary and the perfect way to end a beautiful day. I must also mention the small celebration organised by the town hall to welcome the cyclists from Belgium, which was a pleasant surprise outside the Hotel de Ville and Tourist Information Office at Place de la Mairie. They had erected a marquee under which they were offering various local wines, pretzels, local cakes and fruit all for free: a lovely touch! 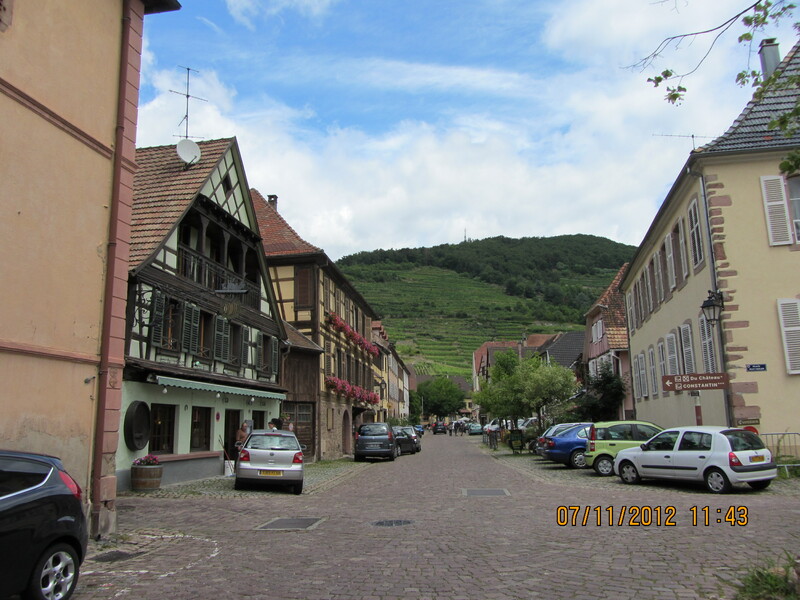 We also got a leaflet with information about the town, which dates back to 1227, when Henri VII, son of Frederic II of Hohenstaufen, bought the Kaysersberg castle and it became an imperial town in 1293 thanks to King Adolphe of Nassau. 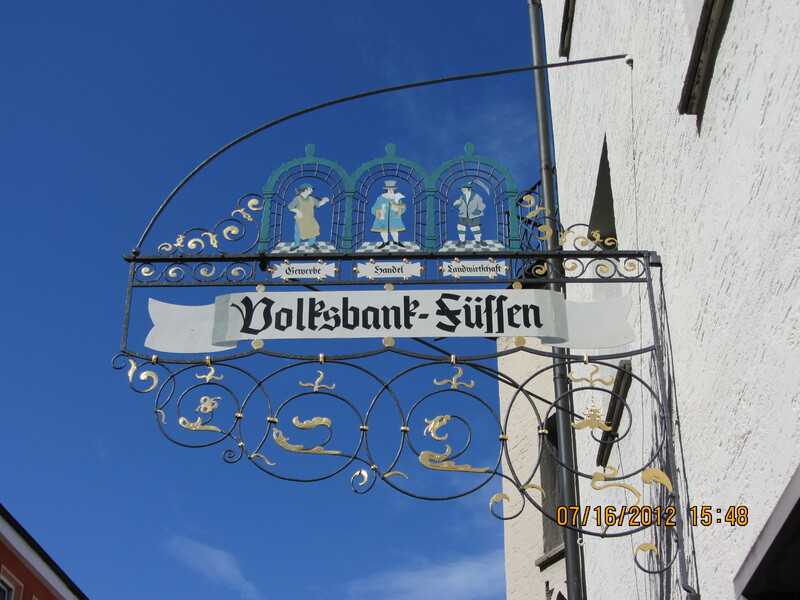 It later flourished as a trade and craft centre, exporting its wines across the Rhine. It’s the eve of Bastille day, so a firework display has been organised for tonight from the grounds of the castle, which we also visited before our meal. It feels now like summer has really begun! Today’s been the hottest and most enjoyable day of this holiday so far. 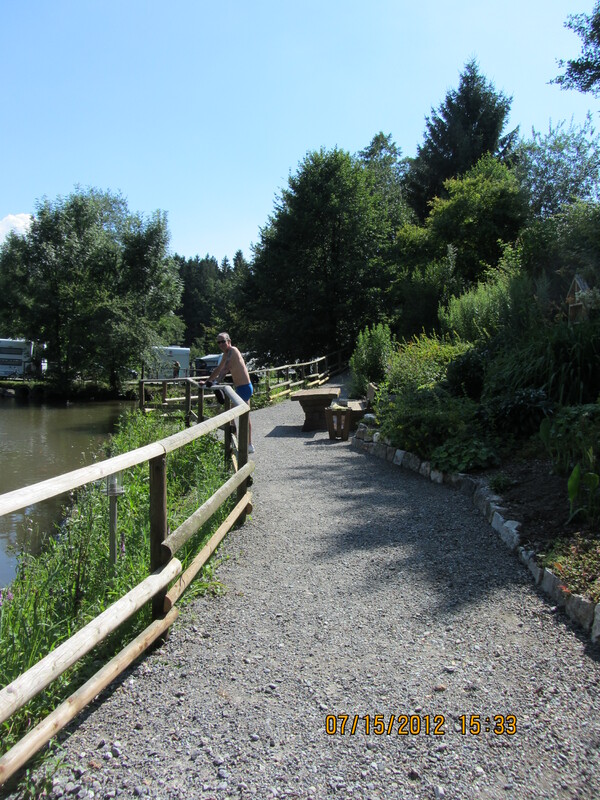 We are staying for a few days at this magnificent campsite right on the river Moselle. 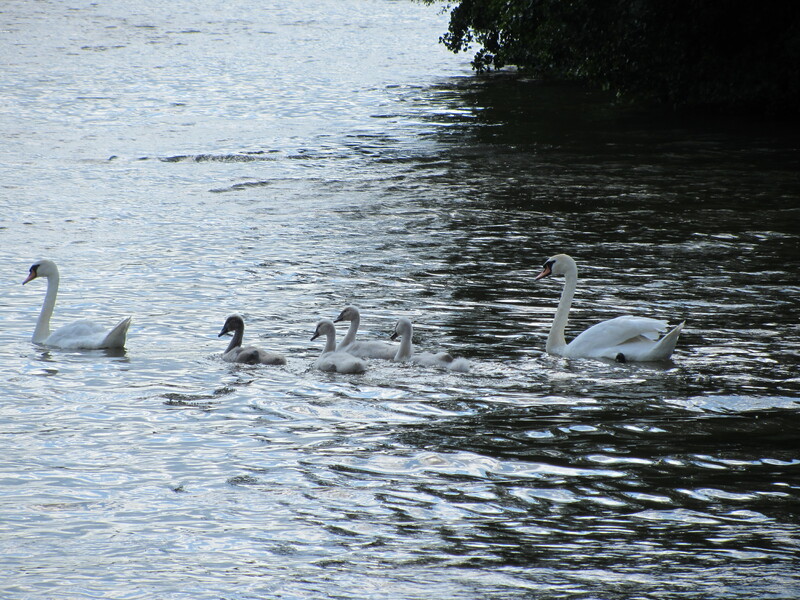 Our pitch is barely 10 metres away from the river itself and Adonis has already found a ‘swim’ in which to fish, but not before doing battle with a very protective swan watching over his brood. That was a sight to behold, funny and frightening at the same time! 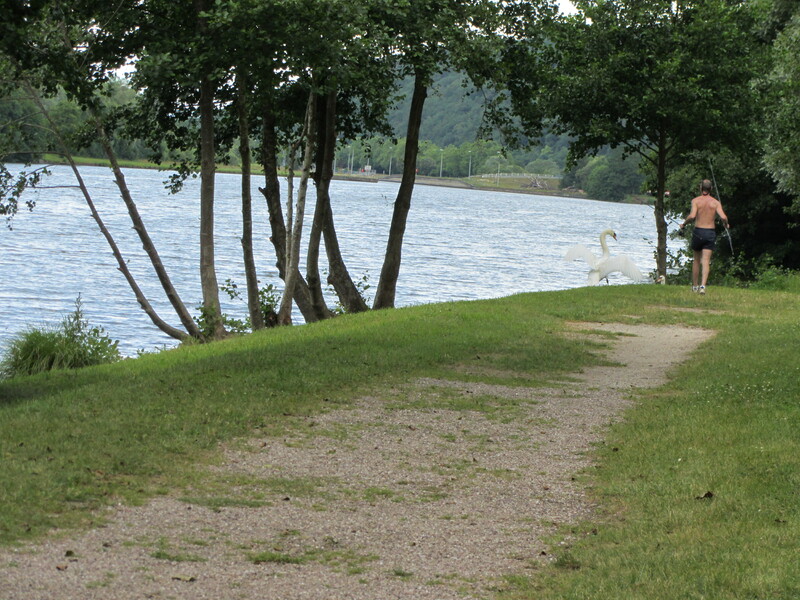 My money was on the swan! 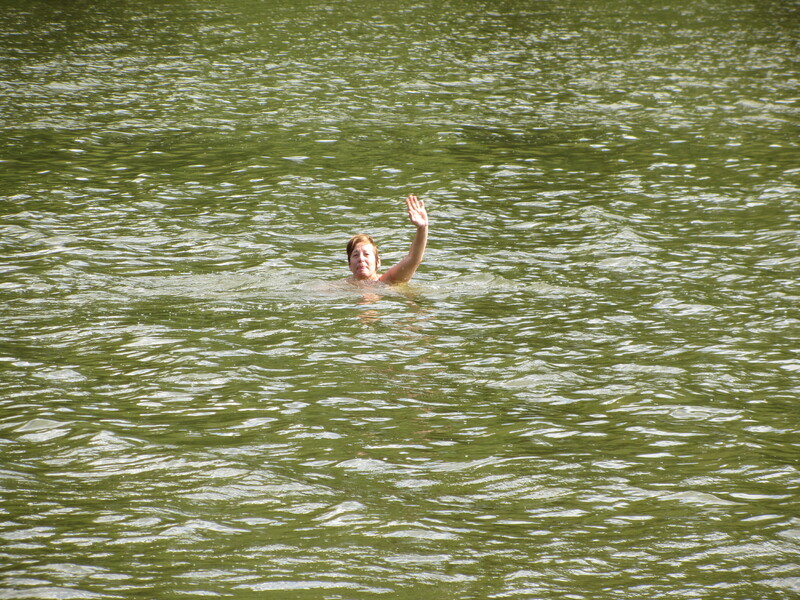 We have provisionally booked for 3 days, but we might stay longer if the weather stays as hot as today: we’ve even had a swim in the river late in the afternoon to cool off a bit and didn’t feel cold at all either in the water or lying on the shore: that’s more like it! The Lillypad windblockers, however, have come in very handy again, as every now and then we get a cool gust of wind that would totally spoil my enjoyment sitting outdoors. 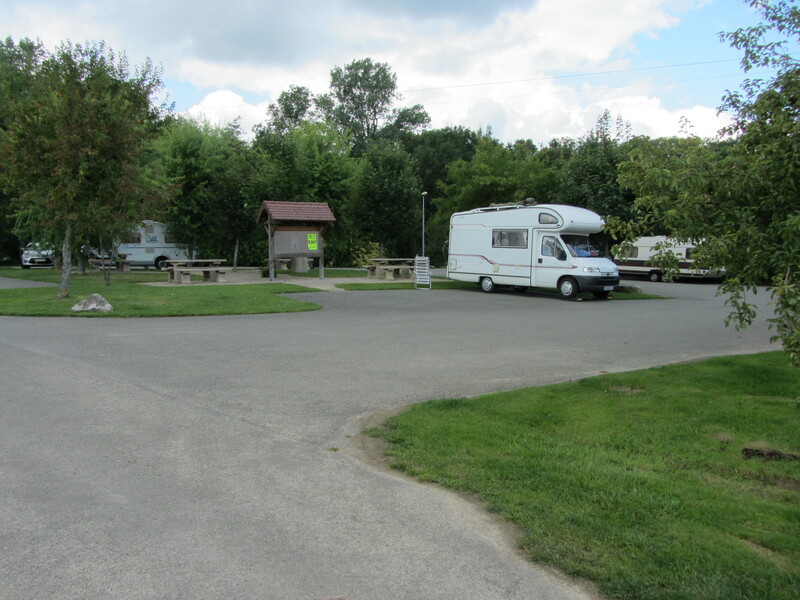 Yes, it is a wonderful campsite, quiet, with lots of space, the river, the fishing, the swimming and very clean and hot showers. What else could you ask for? 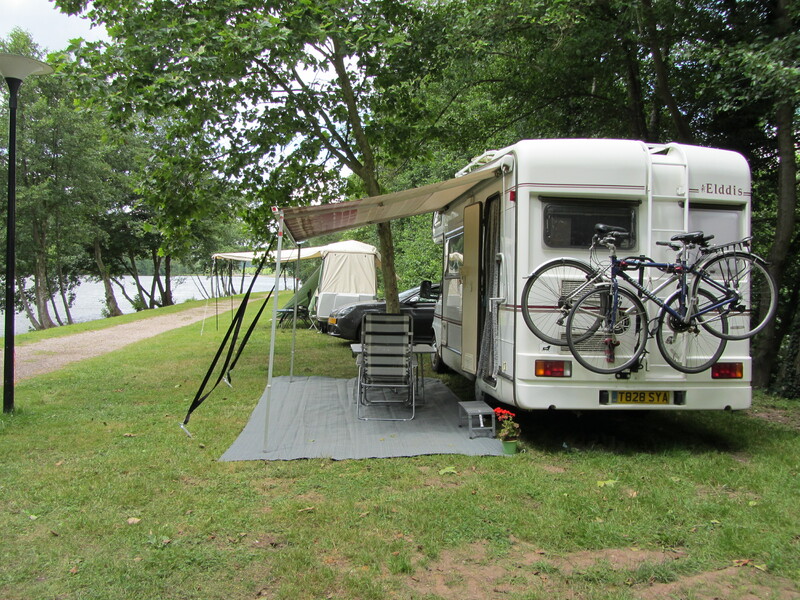 I wasn’t so impressed with the showers at the campsite at Lac des Vieilles Forges, as I had another disappointing lukewarm one at 9 o’clock in the morning, when you really expect them to be hot, and it was the same in the gents’ block when Adonis tried in the evening. I felt like complaining, but the reception seemed to be empty when we left. We did, nevertheless, have a very pleasant walk around the lake and into the village itself and it looked like a charming place to live. 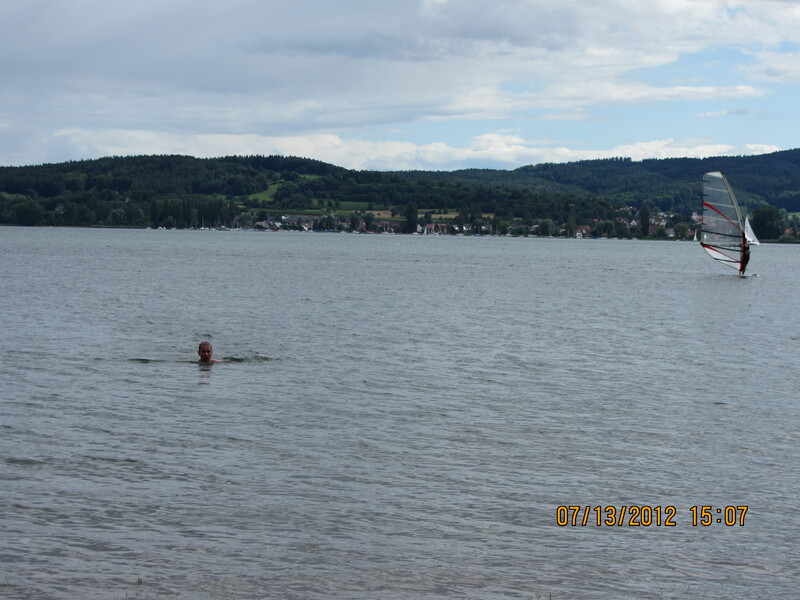 We never managed a swim in the lake, however, as Sunday turned out to be a wet and not very warm day. 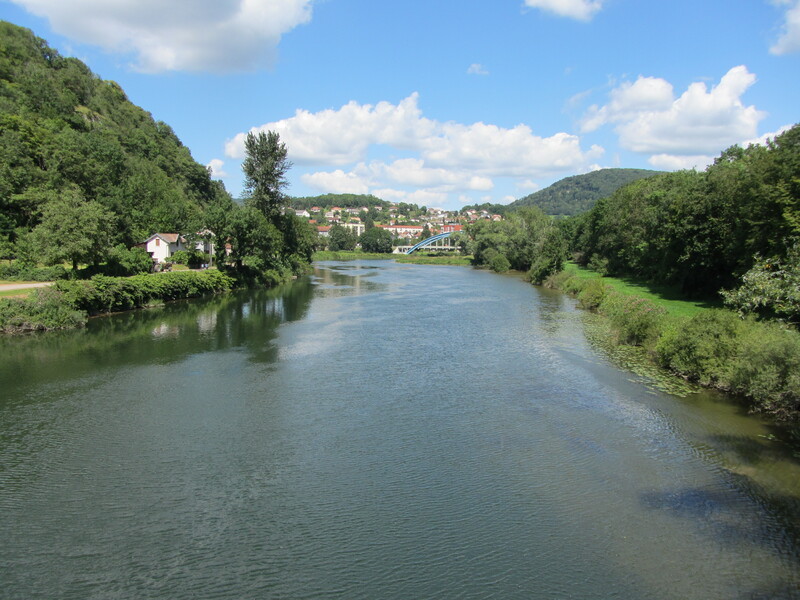 After leaving the Base de Loisirs at the Vieilles Forges, we continued southeast towards Charleville-Méziers and took the A34 for a little while to junction 3 with the idea of following the D4/27 south along the Meuse river, but the signs left us again in true French fashion and somehow we mysteriously re-emerged north of where we were supposed to be at Douzy and ended up following the parallel D964 on the other side of the river, still charming and more direct, all the way to Stenay, just 24 km. Here we found once again an aire with a barrier which needed a code to be got from the Capitainerie nearby for only €7. 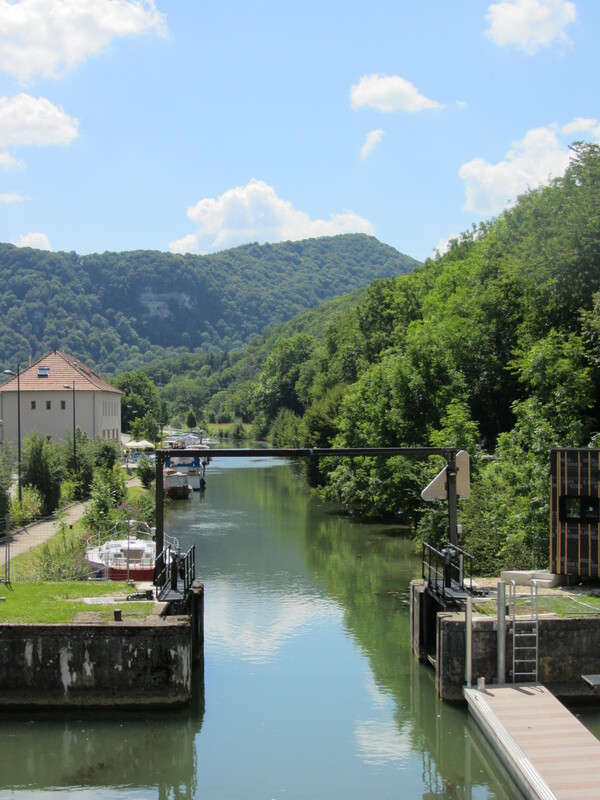 This is a most impressive aire, right where the canal and the river meet, very clean, with free toilets, hot showers and electricity all included in the €7 daily fee: definitely an aire to come back to in future and one to recommend to other motorhomers. The fee also entitles you to a free entry ticket to the Musée Europeén de la Bière, or European Beer Museum, which we didn’t visit as we just wanted to relax in the sun by the canal. So Adonis enjoyed his fishing and I my crochet and reading right by the canal mostly in the sun, although we did have a couple of quick outbursts of rain. The most amusing part of the day, however, was after lunch, when a very enhibrated French motorhomer started singing ‘Coo Coo roo coo coo Paloma’ at the top of his voice along with the radio, but he must have fallen asleep soon after, being siesta time, as he was quiet for the rest of the afternoon, mercifully! We also laughed at the smell from the pre-packed mussels we’d bought at Leclerc. We’d never bought them before and will not buy them again in future for, although they tasted OK, it left the motorhome stinking to high heaven for a couple of hours afterwards, even with all the windows open! 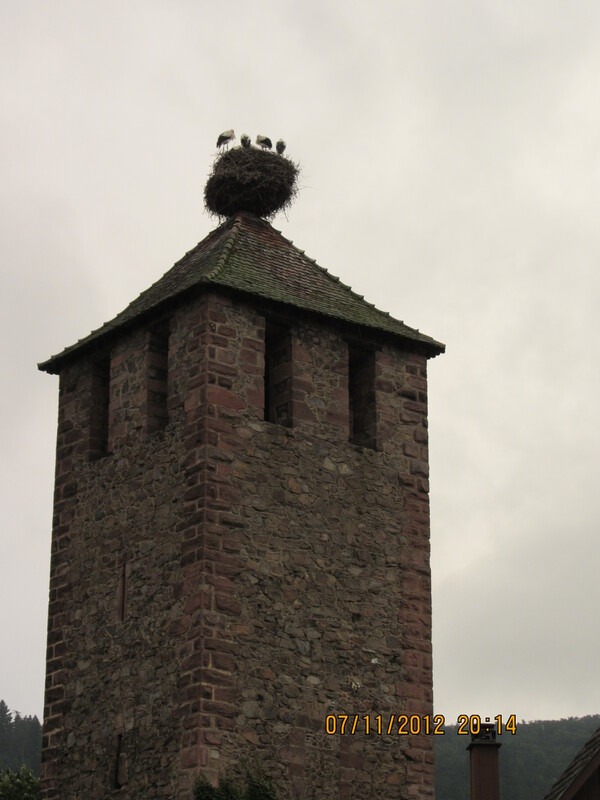 What on earth do they put in them to preserve them? It makes one shiver. Lesson learned: Never put convenience over freshness! Tonight we had a more pleasant experience with my home-made spaghetti Bolognese, cooked with fresh mince-beef: no nasty surprises there. There’s a restaurant-bar at the campsite, so we might give it a go, as we haven’t celebrated our wedding anniversary properly yet due to Bramble’s passing a few days before and we were not really in the mood for any celebrations. 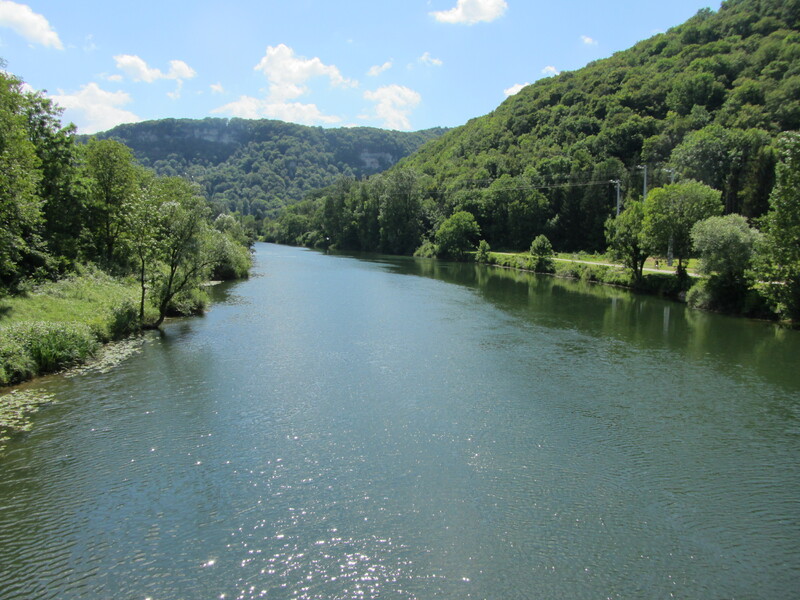 The D964 road from Stenay to Verdun and D903/904 from there to Toul and Villey-le-Sec is a very easy and scenic ride and only took a couple for hours, taking it very easy. Who needs motorways anyway?